Following the previous review that was dedicated to still images we now go into the subject of 4K video with the Panasonic LX100 and related Nauticam LX-100. Currently there are only two compact cameras that produce 4K video the Sony RX100 and the Panasonic LX100. 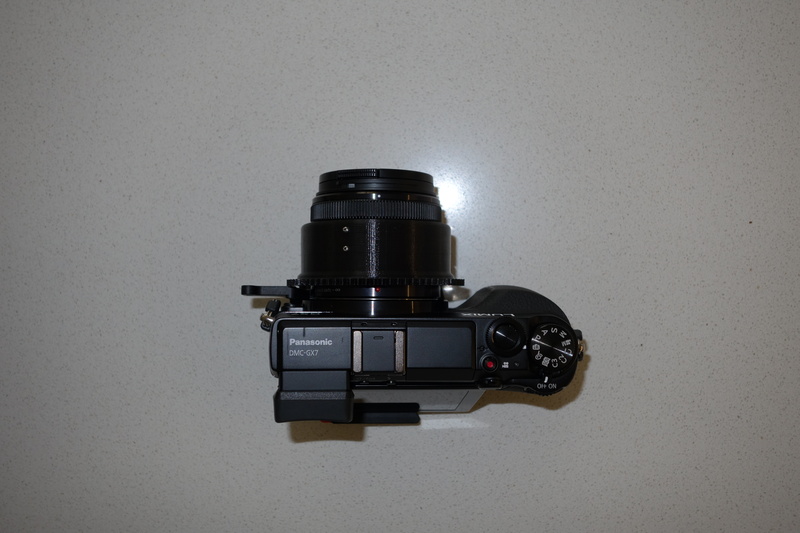 The housing for the Sony RX100 has a traditional M67 port whilst the LX100 uses the N50 compact port system. This means you can use all your wet lenses with the RX100 without specific adapters. 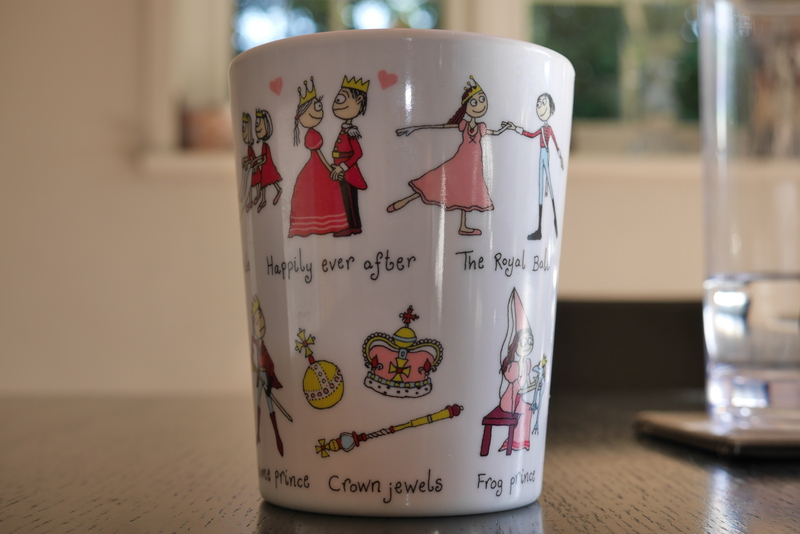 The LX100 has however a number of benefits. This table compares the field of view of the two cameras in 4K video mode. When the camera shoots in 4K mode the focal length remains the same however the camera uses a smaller part of the sensor. 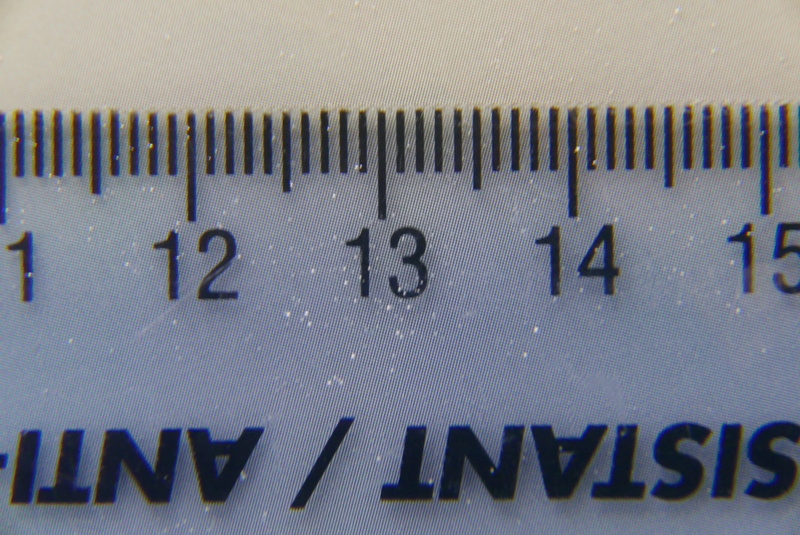 A normal micro four third sensor measures 17.3×12 mm whilst the 1″ sensor of the RX100 is 13.2×8.8 mm. Note that the LX100 does not use the whole sensor due to the multi aspect format that keeps the diagonal field of view unchanged regardless of the image format. What we can see in the LX100 table is that although the focal length in 4K is 26mm the horizontal field of view is the same of a full frame camera with a lens of 23.86mm this means the field of view in 4K should be slightly wider than a picture taken by the LX100 in 4:3 format. 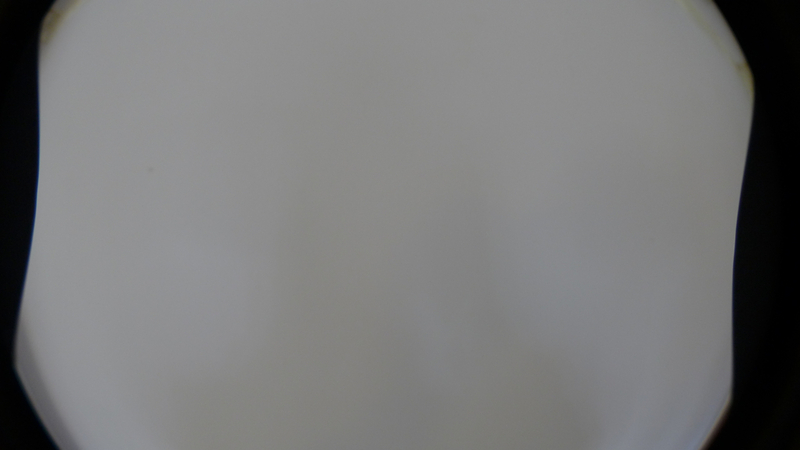 I put the camera on a tripod and took two sample shots, this is the first at 24mm in 4:3 format that I then cropped to 16:9. 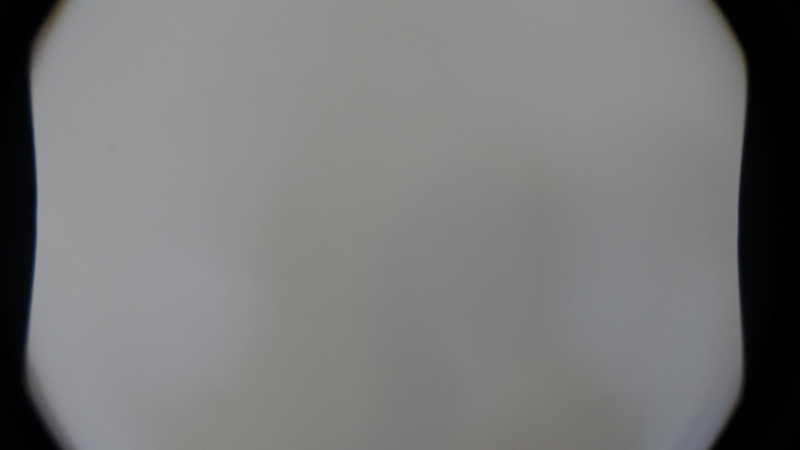 This other shot is from exactly the same position taken extracting a 4K frame from a small video. As stated the horizontal dimension is just a few mm wider in 4K 16:9. What this means is that this is the same that any normal camera with a 24mm lens that then is cropped to movie format in terms of field of view. The Sony RX100 does not have a multi aspect sensor and therefore the horizontal field of view drops more. With the short port on the LX100 using a wet lens like the Inon UWL-H100 we can achieve more than 97° horizontal which is very wide and zoom all the way to 79° and if we use a wetmate or the mini dome cover the other range between 72° and 50°. 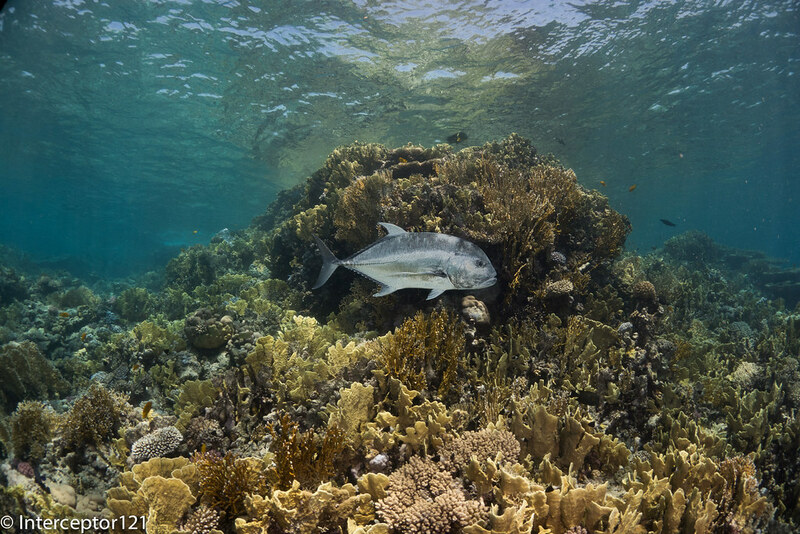 Practically the LX100 with wet lenses and wetmate or minidome gives you access to focal lengths between 15.5-21mm and again 24-35mm is like having an 8-18mm lens on a micro four third which is good for whale sharks and mantas this is even wider than the 7-14mm lens on a Panasonic GH4 in 4K and the LX100 has a (weak) optical stabiliser on the lens. The RX100 mark IV instead can only cover between 96° and 90° before the wet lens stops working properly and we jump to 68° if using a wetmate. 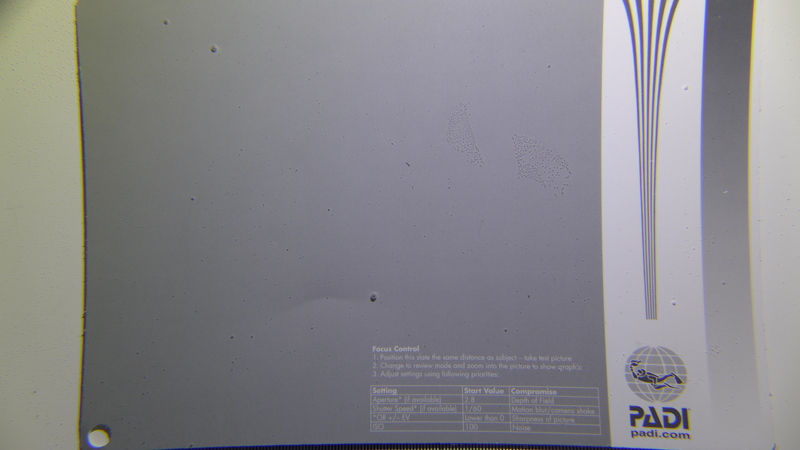 This shot taken at around 15cm shows a nearly rectilinear and very wide image. In short if you are after some super wide angle in 4K the LX100 is definitely the way to go. From an ergonomic point of view I shoot video in shutter priority and let the camera work out ISO and aperture, this is relatively easy to do with the LX100 although the absence of custom memory modes on a mode dial is painful. A control that can be quite useful due to the tendency of the LX100 to go focus hunting is to set the ae/af lock button to af-on. 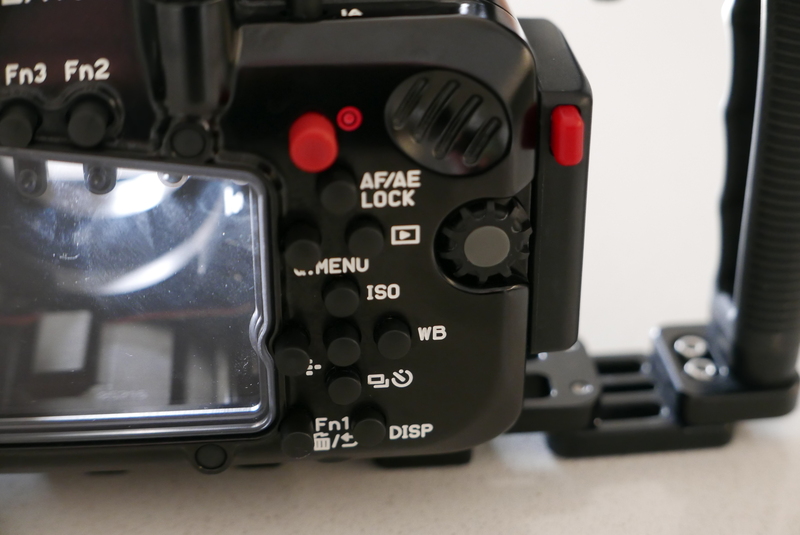 This requires the shutter to be set in release priority with this control you can use manual focus and force the LX100 to refocus when you hit the af-lock. This is a very useful feature. Update 28 September the method described to fight focus hunting does not work in 4K. There is going to be another post with the best settings for 4K video for the LX100. For what concerns macro both the LX100 and RX100 present their challenges due to the short zoom lens, the LX100 more so due to the horrible rectangular port. It can be argued that you can’t shoot wide and macro with the LX100 whilst you can do that with the RX100 however the strength of the LX100 is certainly in its very wide lens and the short port that combined with a flat wide angle lens can produce an extremely wide field of view able to cover practically almost any wide angle scene. For macro the GH4 and upcoming GX8 are probably going to be better placed due to the higher crop factor giving focal lengths in excess of 100mm using the 14-42mm lenses. If you want to get into 4K video and your focus is primarily wide angle the LX100 is an excellent device. Nauticam has given me the opportunity to test the housing for the Panasonic LX100 priced at $1,200 or £922 in UK. As anticipated some time ago this housing features the new N50 mini port system for compact. The housing comes with the rectangular port as a standard, as the LX100 has a 24mm equivalent lens and the lens extends quite a lot between the shortest and longest focal length it is not possible to use an M67 long port or there will be vignetting. In order to install the camera you need to set the aperture to f/16 and the aspect ratio to 4:3 with focus mode in normal and lift the zoom lever. Likewise to take the camera out of the housing. 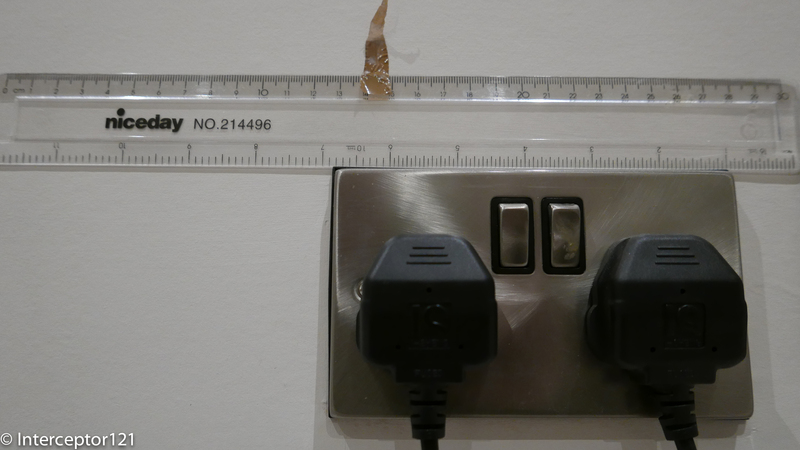 Unfortunately as mentioned several times on this blog pincushion distortion severely affects the image at focal lengths shorter than 35mm equivalent as our in water test shot demonstrated. If you zoom in the corners you can see also extensive blur and chromatic aberrations. Furthermore the lack of an M67 port means you now need the Nautical flip diopter for rectangular port that costs $220 or £170. When you eventually get to put a diopter on the lack of zoom means that magnification with traditional lenses is quite limited. 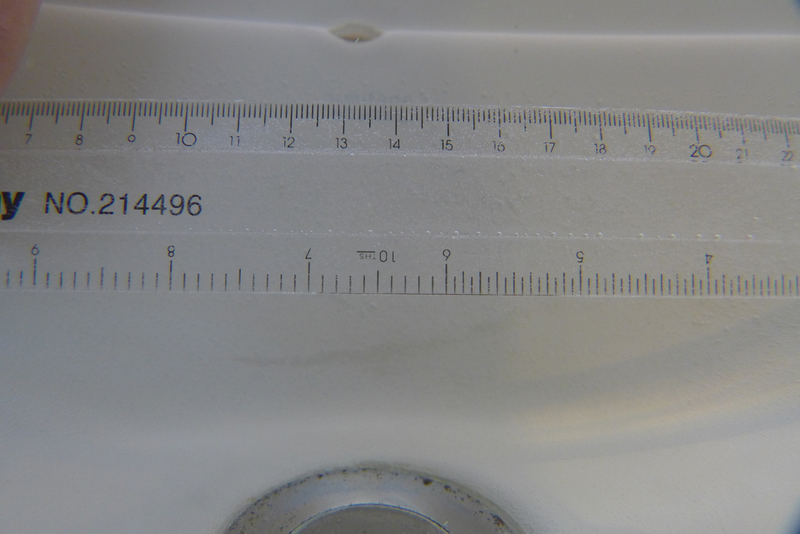 The frame width is 62mm with a single Inon UCl-165 and goes to 5cm when we stack another UCL-330. 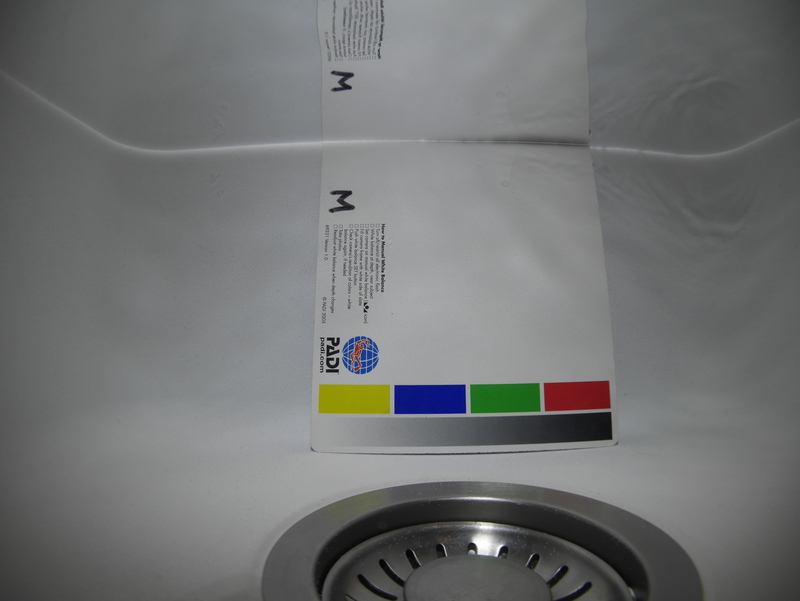 Image quality is ok except some blue fringing at the borders. 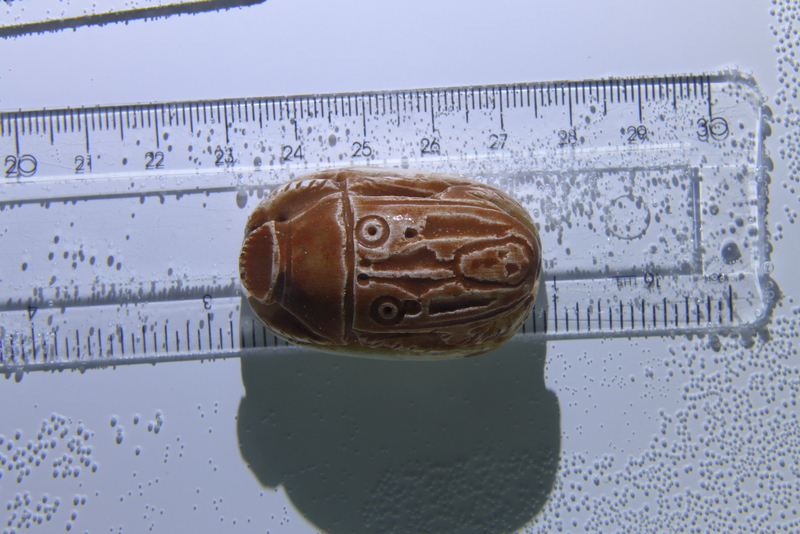 A single UCL-100 gives a frame width of 42mm. 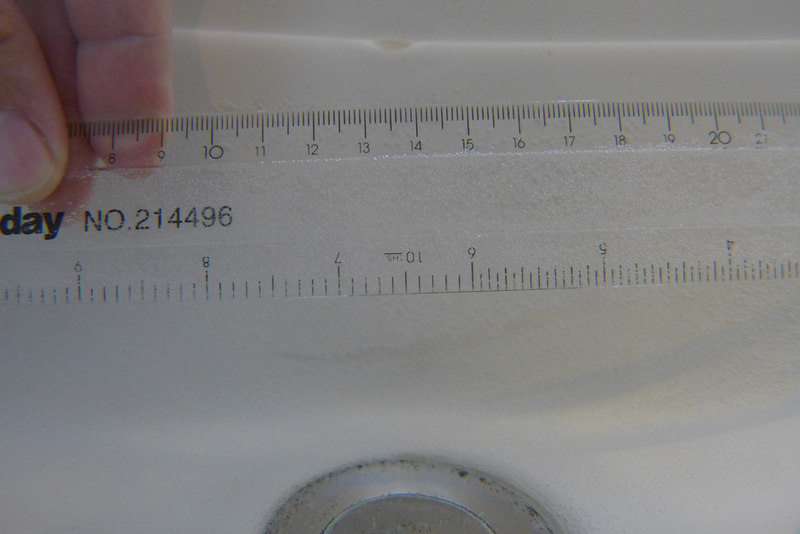 Apparently the Nauticam CMC ($320 or £240) gives 32mm frame width that is adequate for macro. So if you are into macro you need to invest $1,200+$220+$320=$1,740 to have some decent magnification. If you possess many clamps and cold shoe ball mounts you can buy an Inon M67 lens arm and use the lenses you have saving some $$$ but the magnification is limited unless you get the CMC. For semi-wide angle a mini dome port is available at $280 or £216. 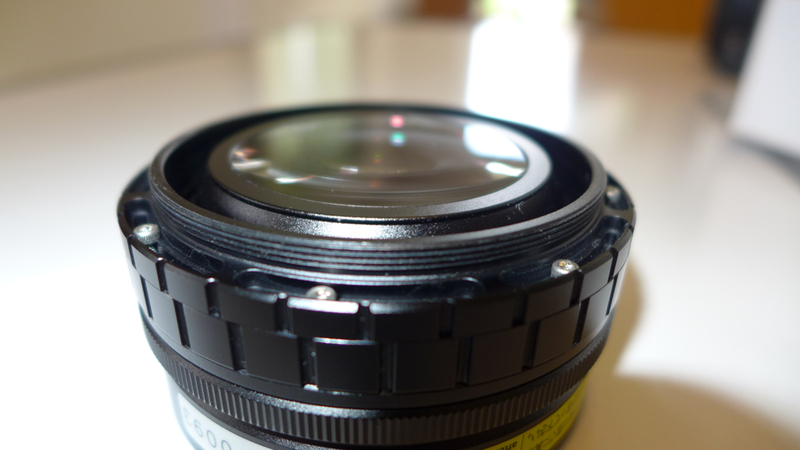 This restores the field of view in air however you can only zoom to 40mm before the camera can’t focus anymore. I have even tried with dry diopters on the camera there is no improvement. Probably the most useful port is the N50 short port that has an m67 thread and allows to use wet wide angle lenses. 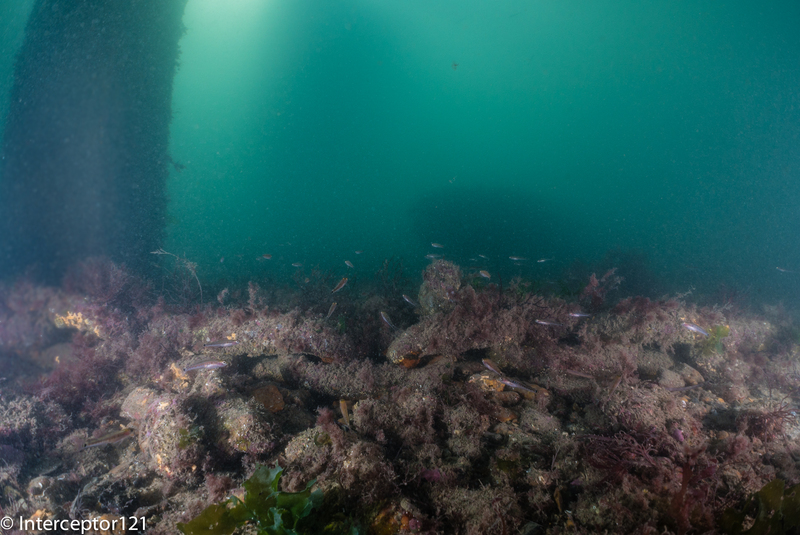 I went to Swanage but got the tide wrong visibility was shocking still gives an idea of the image quality of the LX100 with the Nauticam WWL-1 wet lens. If you have a Nauticam wet mate you can also use it with the short port and achieve the same or better sharpness than the minidome thought with some residual chromatic aberration. The big benefit is that if you find that your wet wide angle lens is too wide for what you are shooting you can change lens without changing the port. For what concerns the ergonomics of the LX100 they are quite intuitive on land. One of the characteristics is the lack of a mode dial. You have an auto position for shutter speed and aperture and if you leave them as such the camera shoots in program mode. Once you move the aperture the camera goes in aperture priority mode. Probably the worst situation is the shutter dial that once touched has to come down all the way from 1/4000 to whatever you need it to be. Also you don’t have thirds of exposure for the shutter dial and for example to get 1/50 you need to go to 1/60 and then use the rear dial. 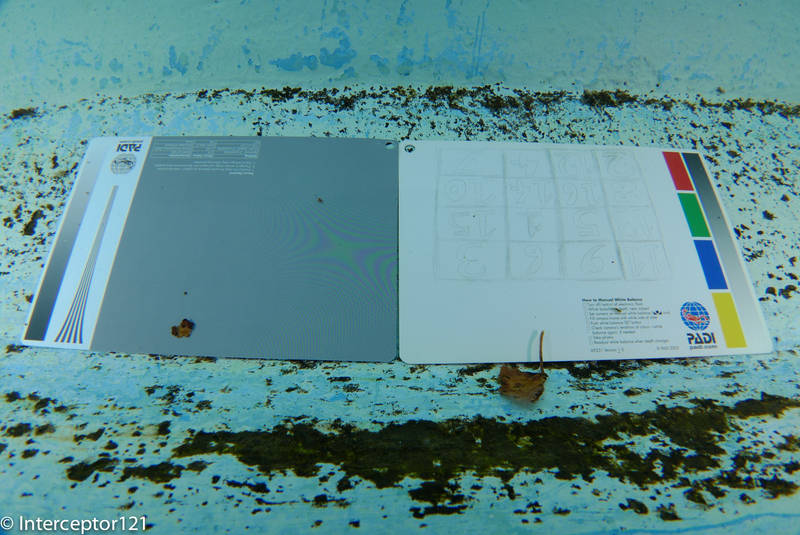 I found the ergonomics of the camera in water particularly annoying as I was shooting with gloves. I did like the nauticam trigger system for the shutter however the amount of hardware of the nauticam tray and its weight are not really an option for me. The Panasonic LX100 is a very interesting camera on land but in water ends up quite uncomfortable and expensive. The housing with the 3 ports comes at $1,200+$180+$280 if you add the Nauticam CMC and the WWL-1 you end with a whopping $3,195 the camera costs another $800. Total investment $4,000. This is a lot of money in my opinion considering that with another $300 you can get a Panasonic GX7 with GX7 housing, an Olympus 60mm with 65 macro port and a Panasonic 8mm fisheye with 4.33″ dome. The LX100 and GX7 share the same sensor but there is no doubt that the macro performance of a dedicated lens as well as the fisheye of the 8mm lens have no comparison. In conclusion the Panasonic LX100 with NA-LX100 is a bit of a flop for stills the only use that I can think of is wide angle 4K video with the short port and a wet lens but other than that I don’t see how Nauticam is going to sell many of those units. 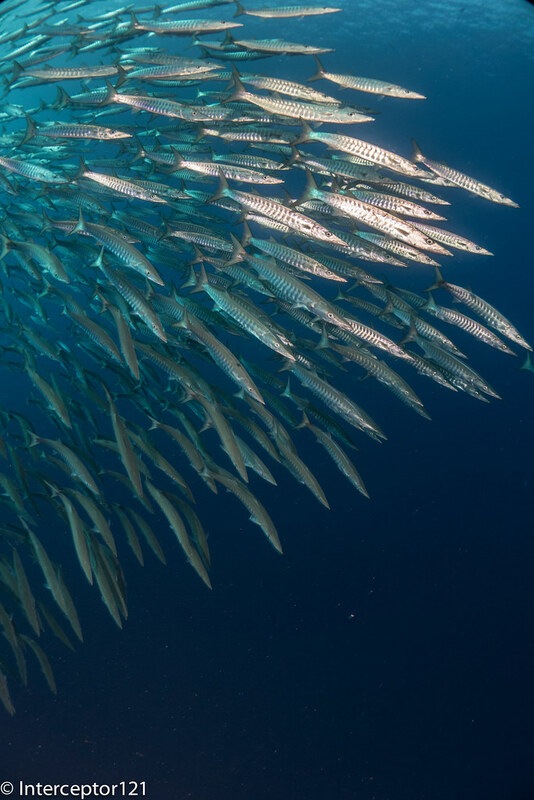 Micro Four Thirds camera have become increasingly popular for underwater photography especially for macro and close up subjects in the last years. 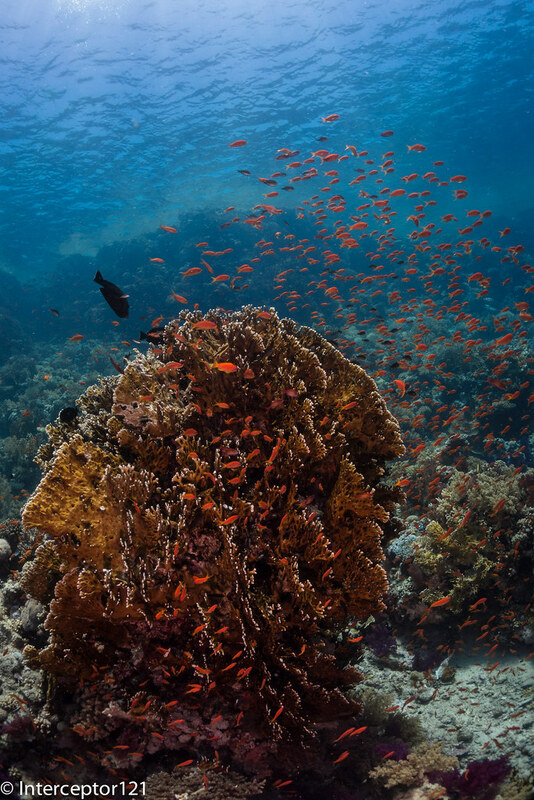 The micro four thirds standard is shared between Olympus and Panasonic however in terms of underwater use Olympus is on the forefront and in fact it produces their own poly-carbonate housings for all new models. Nauticam has their own N85 port system for micro four third that as of today has 10 different ports, two extension rings and a large number of focus and zoom gear. You can also buy cheaper 3D printed gear to save a few bucks for majority of lenses. The other interesting characteristic of the micro four third market is that since the introduction of the 16 megapixels sensors, there have not been any substantial improvement in image quality among the various model, we will have to see what the 20 megapixels sensor of the Panasonic GX8 will bring but all in all the camera choice is mostly one of ergonomics and features. Olympus is quickly clearing stock but you can still found the OM-D E-M10 out there for £478 with kit lens. The might Panasonic GX7 is now £433 with kit lens. In US you can find both the Panasonic GX7 and the Olympus O-MD E-M100 for $599 with kit lens. The Panasonic LX100 sets you at £589 in UK and $698 in US really if you are into photography and want a micro four third it is a no-brainer you get a previous version GX7 or OMD EM10 (as you can’t find an EM5 new) and happy days. 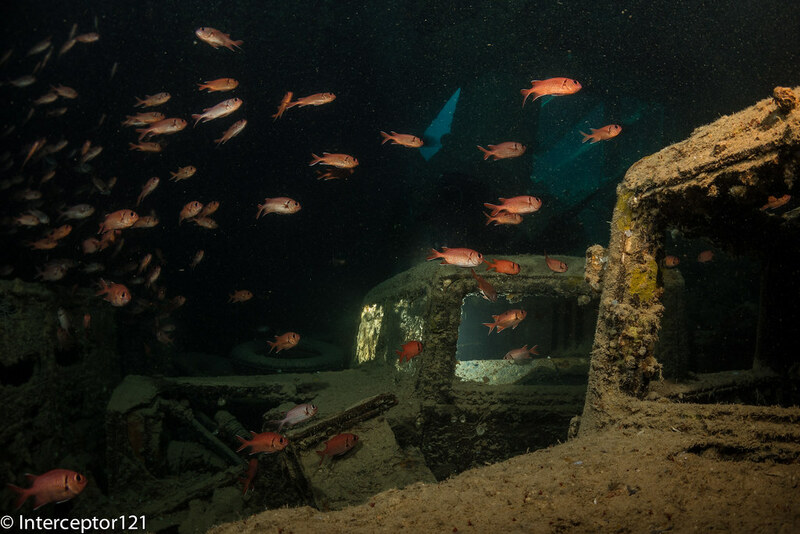 Now that you have committed to the camera you are into lenses and ports for underwater use. The Olympus housing costs on average 25% less than Nauticam and has less choice of ports for me really is not appealing so let’s assume we are into Nauticam. What lens or port to choose? 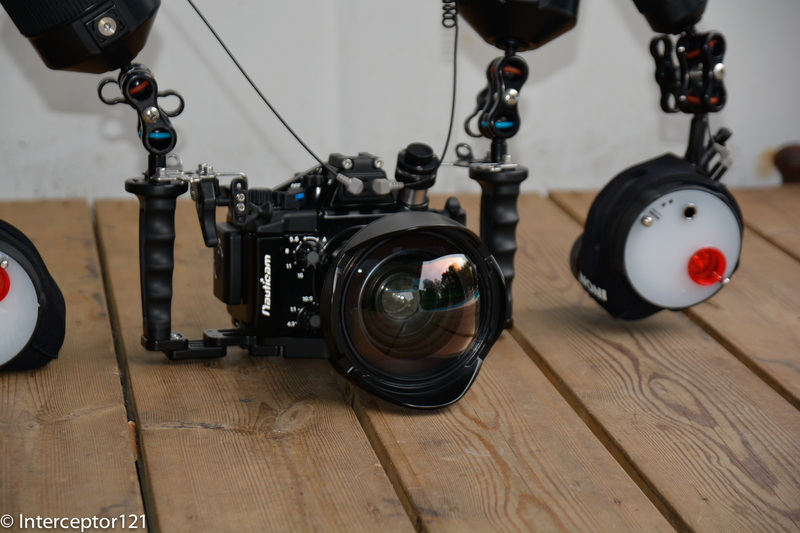 Both the Olympus 14-42 EZ and the Panasonic 14-42 II fit in the Nauticam 35 port and require 3D printed gear to operate. The flat port will be OK for fish portrait and if you already have wet lenses it is definitely recommended to buy the 35 macro port first especially if you shoot video. Both lenses do need a wet diopter to shoot small subjects in water as the smallest frame is around 7-9 cm width otherwise. If you come from a compact camera most likely you have wet lenses and therefore you can re-use them for close range work. Obviously a flat port for a 28mm equivalent lens is not a solution for wide angle. First of all at the wide end due to water magnification the angle of view is the same of a 37mm lens which gives a field of view of just 60 degrees. 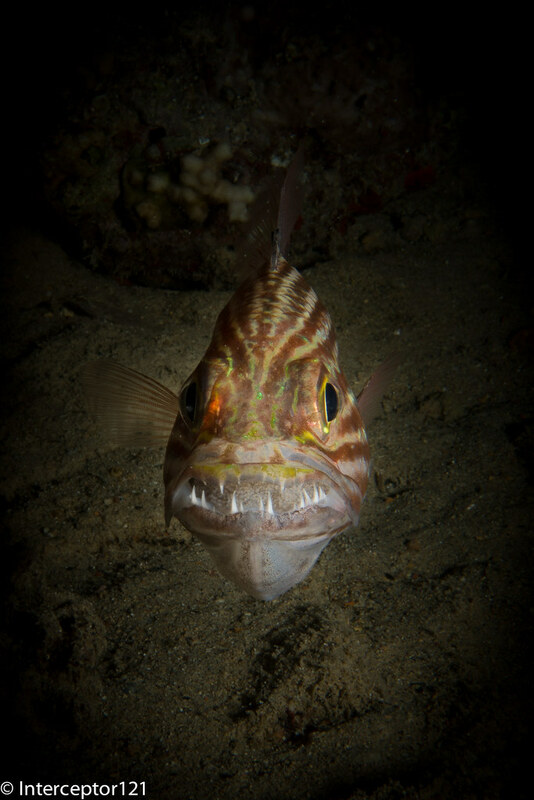 The other point is that you really want to shoot at the tele end to avoid cluttering the background too much and typically in water those kit lenses work only at over 25cm from the port which means they are only good for medium size fish portraits. 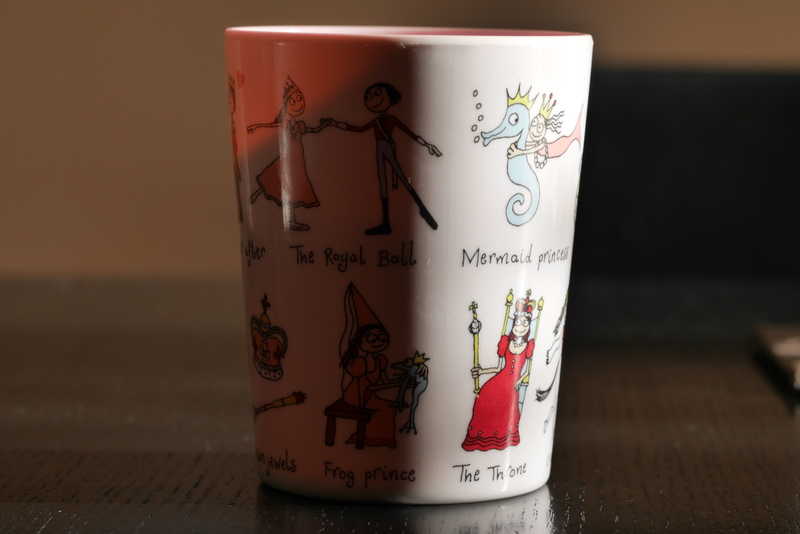 The sequence of shots shows that even if the size of the cup is pretty much the same it looks much better at long focal length. 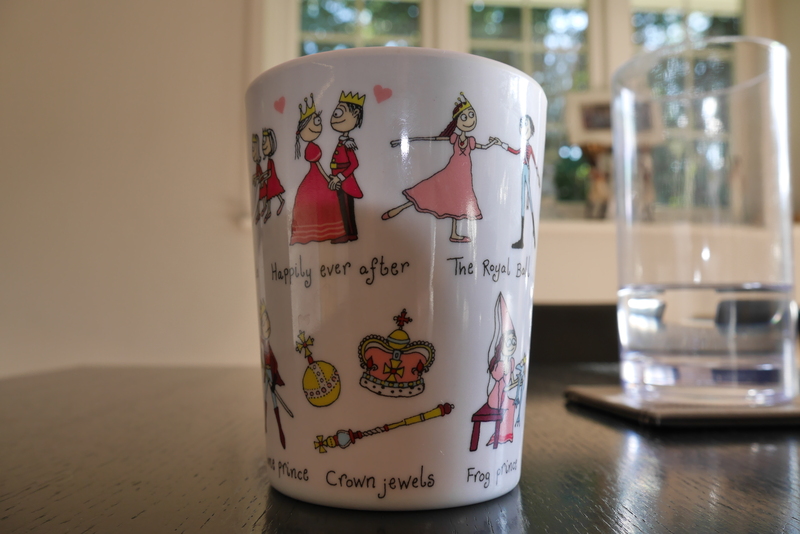 At 28mm you can see the glass in the frame on the right side and the window in the background. At 50mm with similar size of the cup the glass is half gone and the cup looks nicer less of the window is showing. at 42mm the glass is nearly out of the frames and the windows in the background is gone. If you did not have any wet diopters the first additional lens and port to get will depend on your subjects, if you shoot macro you need a macro lens, if you shoot close focus wide angle you need a fisheye lens it is as simple as that. The Olympus macro 60mm is the preferred lens combined with the Nauticam 65 port (or 35 port plus 30 extension). 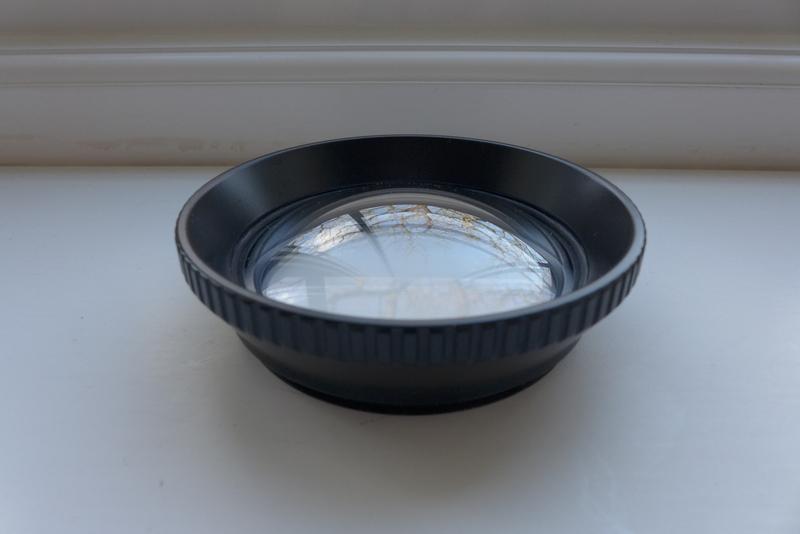 This lens can focus 10cm from the port and therefore can be used also in low visibility. Really there is no reason to use the more expensive 45mm Leica lens. The 60mm is great also for portrait work of small fish. 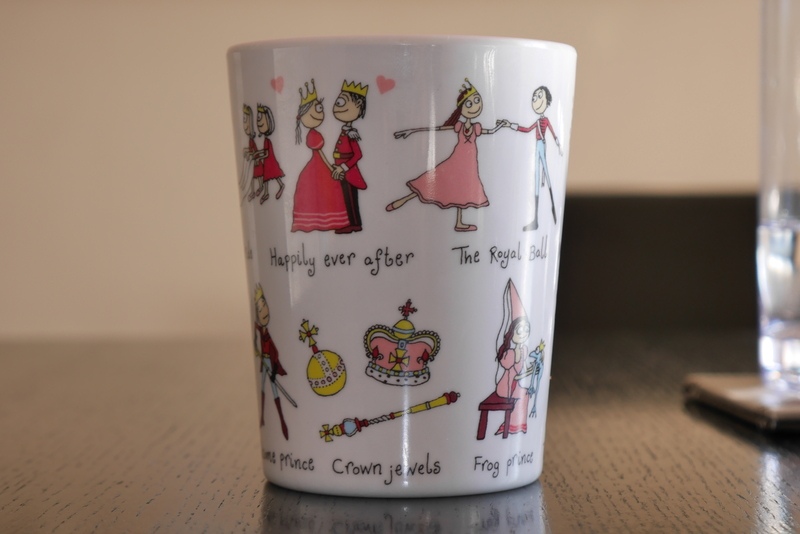 The same shot of the cup at 60mm means we now say goodbye to the glass due to the reduced angle of view. The increased working distance also means a more pleasant perspective. I hope this explains why for underwater macro we want to shoot with long focal length as this helps us to get rid of the background so a longer lens will always be better than a zoom lens with a wet diopter and it will also give more magnification in case you have really small subjects. If macro is not your priority and you are happy with kit lens and diopter for wide angle the first option is the Panasonic 8mm fisheye, that since the introduction of the Olympus 8mm pro fisheye has also reduced in price. 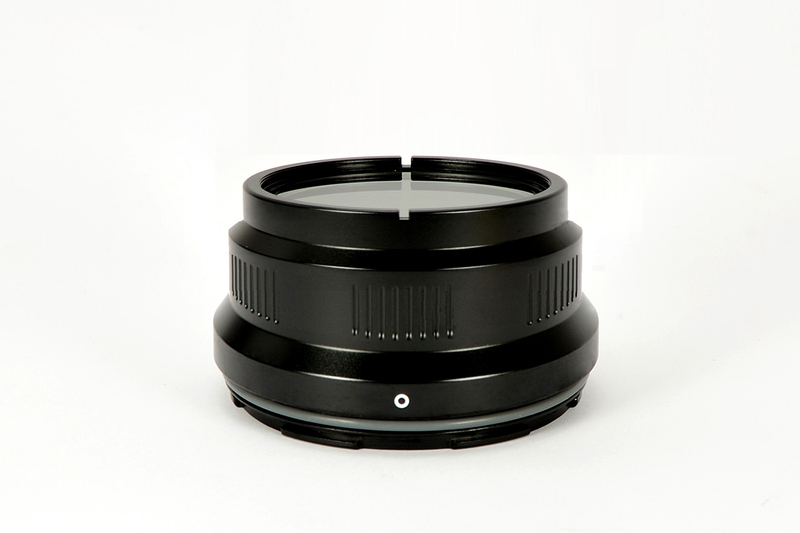 This lens works best with the Nauticam 4.33″ dome port. 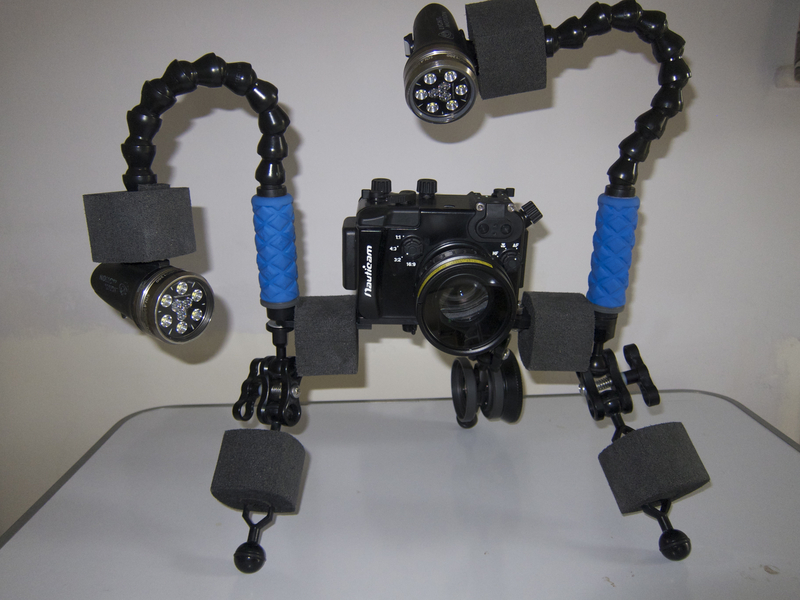 If you shoot in 3:2 format you can also try the Nauticam 3.5″ wide angle port that makes the set up even smaller however there are no substantial improvements on how close you can get as the strobes will fail to lit properly anything that is right on the port without risking to see the strobe lights in the frame. The 3.5″ port will vignette in 4:3 image format though some users report success. 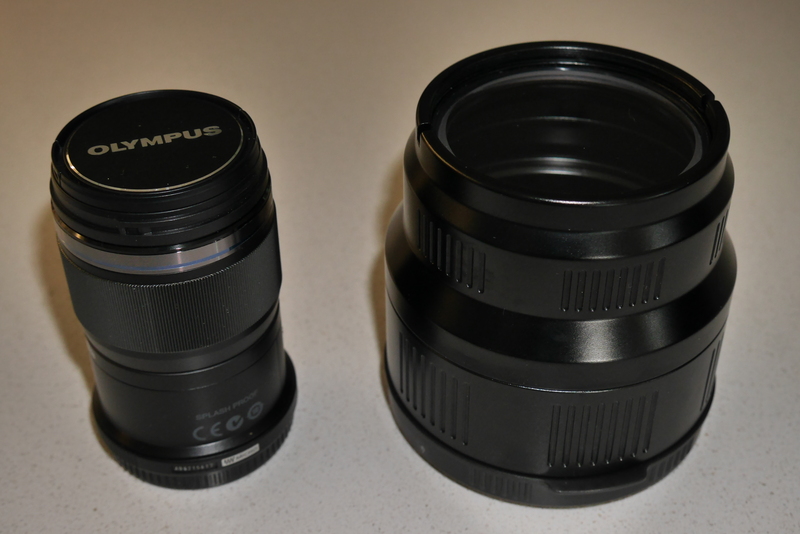 The issue of the 3.5″ port has been put forward again with the argument that it allows you to get closer than the 4.33″ dome with the Olympus EM5. I do not have an EM5 but I do have a Panasonic GX7 the end of the dome is 9 cm away from the focus point and this means that the dome allows you to get closer than the minimum focus distance of the lens of 10cm. As the dome is shorter than the minimum focus distance on the GX7 the 3.5″ port does not bring any benefit. 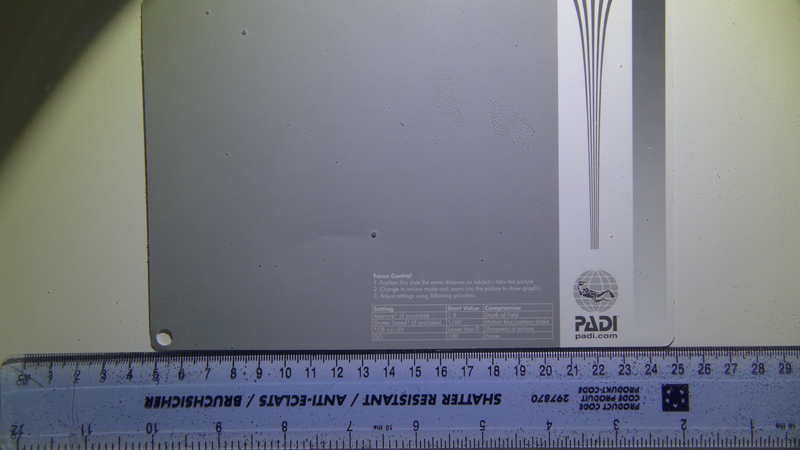 Furthermore as trays are in general around 30cm you need to be around 15 cm anyway to be able to illuminate the subject properly with edge lighting, in virtue of this I remain convinced that the 3.5″ port does not bring any real benefit except is a bit cheaper and may vignette. So your starter kit if you upgrade from compacts of you own a close up lens is Macro 35 port followed by Olympus 60mm and mini extension ring 30 or Panasonic fisheye 8mm with 4.33′ dome for wide angle. Wide angle zoom lens are less of a priority but the choice is between the Olympus 9-18mm and the Panasonic 7-14mm bearing in mind that if you had a wet wide angle lens you may not even bother getting an intermediate wide angle zoom lens. That’s all for now hopefully this will cover most of the ground for all new micro four third underwater shooters with kit lenses! The Panasonic 8mm Fisheye lens for micro four third is a clear winner for close focus wide angle however the lack of zoom and the really wide 180º cover mean that there are many subjects that will look tiny in the frame. The next option in terms of width is the Panasonic 7-14mm wide angle lens however this requires a large dome for optimal performance making the set up expensive. Is there anything else left if you don’t want to buy a wet lens and you already have the Panasonic PZ 14-42 X Lumix G? Panasonic produces an add on lens DMW-GFC1 that is declared to provide 10.5mm equivalent and reduce minimum focussing distance to 16 cm all specs can be found here. 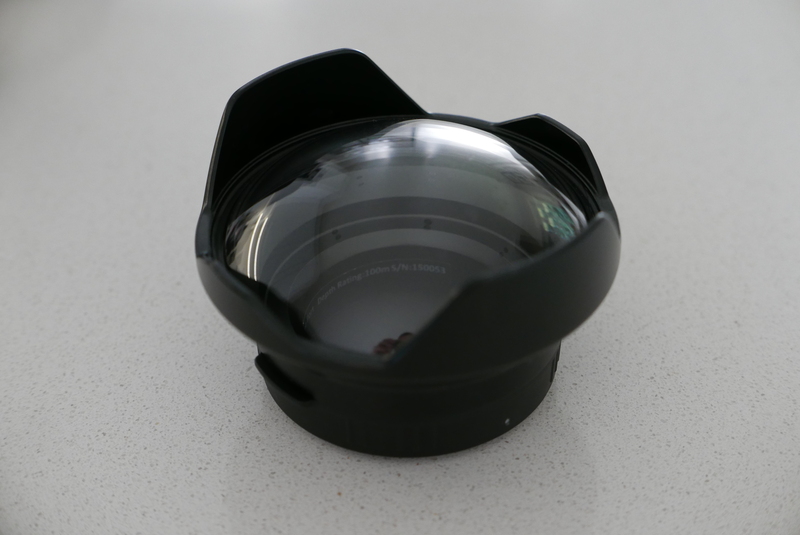 This add on lens can be used with the 4.33″ dome for the 8mm fisheye and the 30 extension. I took a few test shots and the results are pretty good. This first shot is at f/5 and is very sharp in the centre. 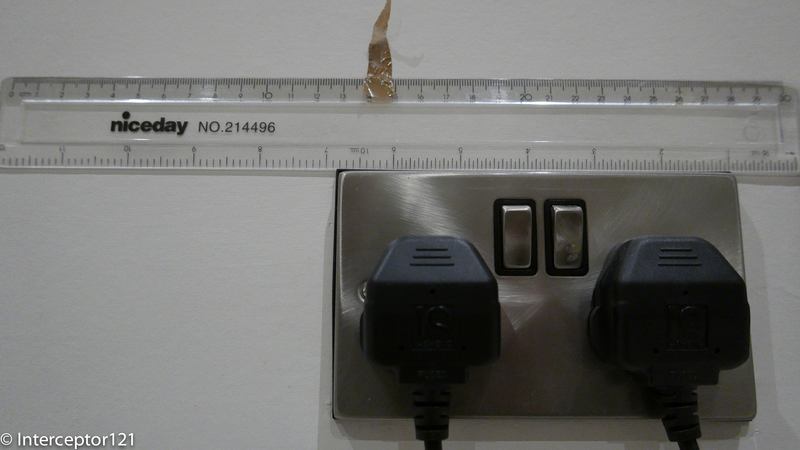 Getting a bit closer and stopping at f/8 the results are pretty good for an adapter that is less than £100 on amazon. Barrel distortion is contained so this combination may be good for wrecks where the fisheye effect is a bit disturbing. If you have the Lumix G Vario X PZ 14-42mm you may want to invest in this little accessory before getting the much more expensive 8mm fisheye even if the Nauticam 30 extension is required. Later on the extension can be used with the flat port 35 and the Olympus 60mm for super macro and the 4.33″ dome of course with the 8mm. 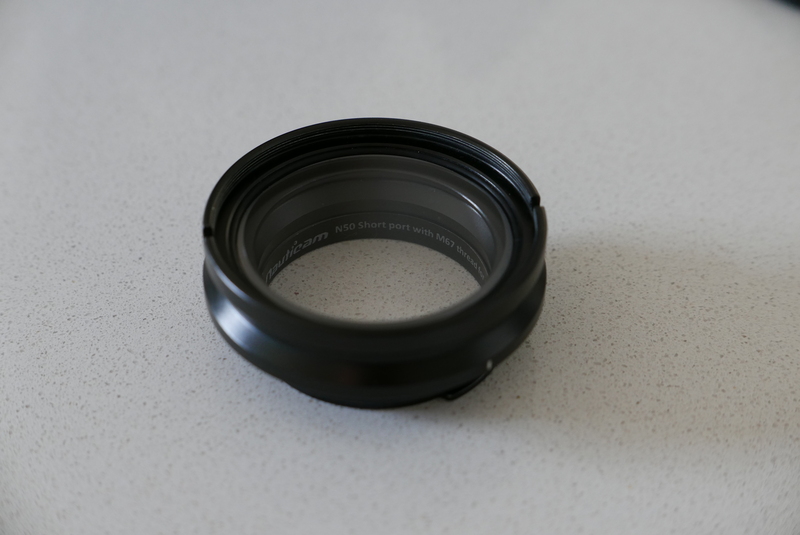 I think it is amazing how much can be obtained out of this lens if we consider wet diopters, wet wide angle lenses and this adapter before you need to get a second lens. This lens could also work for video with the Panasonic GH4 at 4K however zoom is not recommended with it. I thought the Red Sea workshop with Alex Mustard was brilliant to I thought of writing down my notes and sharing them with you. This final post is a general one and has my lesson learned from attending the workshop, those that follow are generic tips that I think would be beneficial to anyone wanting to attend a similar experience. 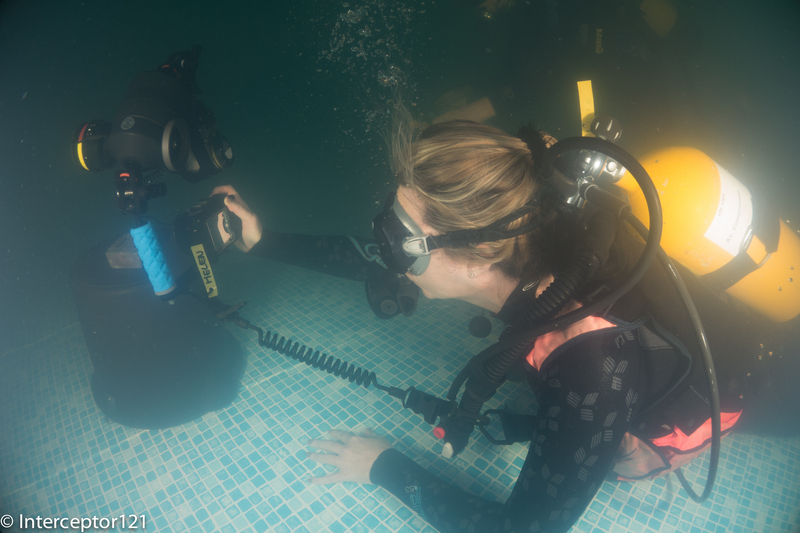 I did not really ask many questions before going as Dr Mustard sent a very comprehensive document however this is not standard and it is better to ask in advance about the conditions, the dives, the type of training and generally how the workshops is organized. 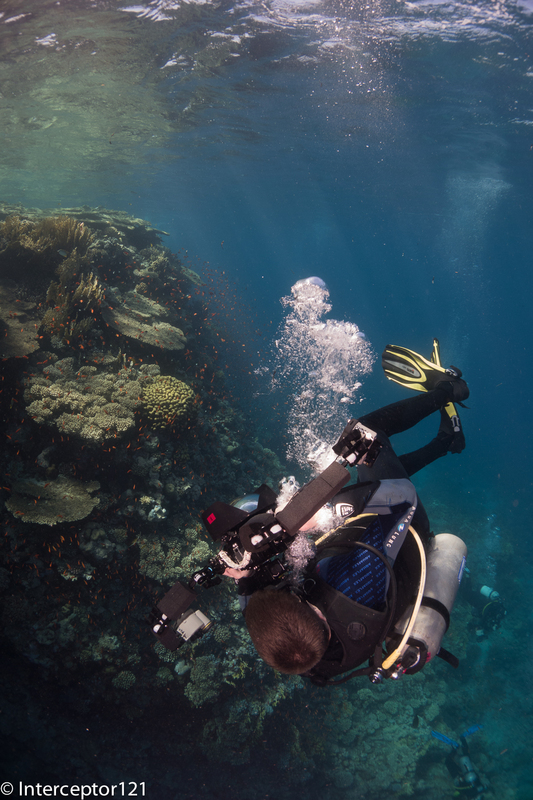 Some have talks, other have one to one, other are just dive trips where you ask when you need. Not all types fit everyone so better to make sure you go to one that matches your need. Sadly even this time like in every trip I have come across people using their equipment or part of their equipment for the first time. 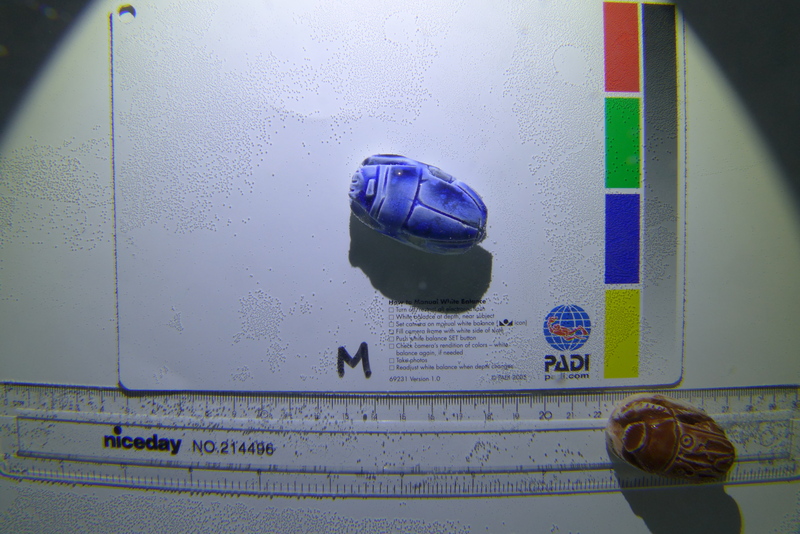 The end results is wasted dives and opportunities, I cannot stress enough that testing your rig in a pool before going allows you to familiarize with it and make any corrections you need. Also take all the possible lens, ports, parts that may be useful. Once you are there you don’t want to have regrets about something you have left home. In my case all was there but I did not know about remote strobes otherwise I would have got myself a trigger as I have 2 Z240s. In most of those workshops buddy system does not really apply so make sure you are self reliant and fit as the conditions allow to avoid embarrassing or even dangerous incidents. Once there dive within your comfort limit and if you don’t really have a buddy dive with a guide. It is useful to know before you go what your objectives are, for example what type of shots you want to work on. This means you have something to do over and above the assigned tasks. Sometimes during those workshop there are challenges or set shot that are suggested, this is your opportunity to compare your work with others and therefore you should make sure you deliver those also to find out if there are limits with your equipment. 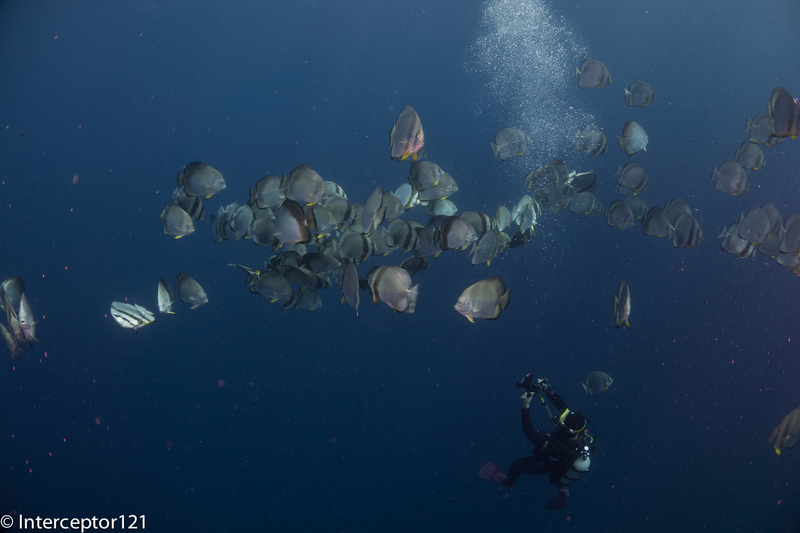 In the Red Sea workshop were given the task of taking pictures of cardinal fish with eggs in their mouth. I realized I could not fill the frame because I lacked a mid range close up lens and my camera would not focus closer. In addition to the suggested shots you should make changes to those and try something different even if not totally different. There are many landscape split shots but not many portrait so why not try one results can be excellent and it is easier with a small dome. Other participants also will give a go to the same shots or have better editing skills it is worth to watch and learn. My buddy was setting up a remote strobe I fired a few shots (unintentionally of course) so I got my own shot! Finally take notes of what you did right and wrong and if you missed anything. After the sessions are over still there is work to do over and above going over your pictures again. Well it goes without saying that I put the notes together and summarized them here. I also found great to connect to other people and then look at their gallery for other shots that we had not discussed before. Finally I ordered myself an Inon UCL330, funny I had this lens and sold it not realizing the real use which is fish portraits!!! That’s all for now if you go on a workshop soon I hope you find this useful. 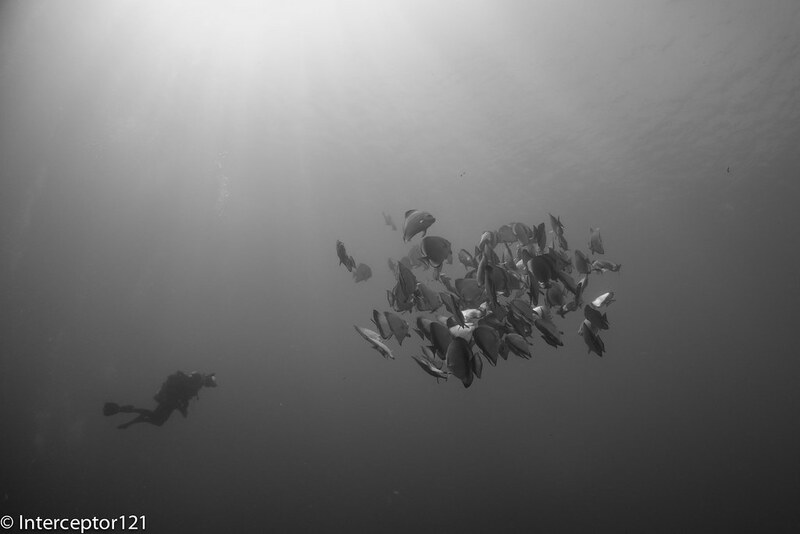 On Friday we were up for our last 3 dives at Shark Reef the current had not changed but this time I decided to give more a go to the schooling fish after setting up all the backgrounds I wanted. As you can see from the image on the title we had more of the usual divers chasing fish but this did not deter me this time as I developed a specific technique to do the dive that I used fully on the last two photo dives. It was time to give it a proper go. To be honest is not that I like batfish that much and probably this is one fish that you can shoot in RAW in ambient light however if you do that you need to sacrifice quite a few ISO stops. With strobes the issue is to get the school in a formation that allows you to do a good job with lighting. This is my best shot for the session. 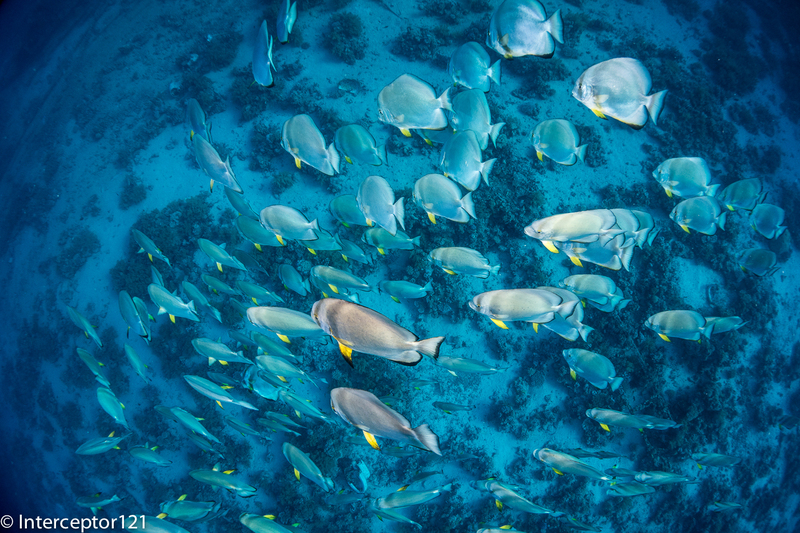 What I like about this shot is the light on the fish or most of it where you can see yellow fins but also the background and a hint of surface. Other fish that featured on the day were jacks but catching a school of those running past is quite hard unless the school is really big and they circle you. In those type of formation you have all sort of issues with hightlights form the strobes in fact I was shooting 1/4 of power. Giant trevallies made a more interesting single fish shot like this one. Contrary to what you may think this is a shot with strobes otherwise you would not see the texture of the fish as you see it. Maybe a busy background but good technical exercise. 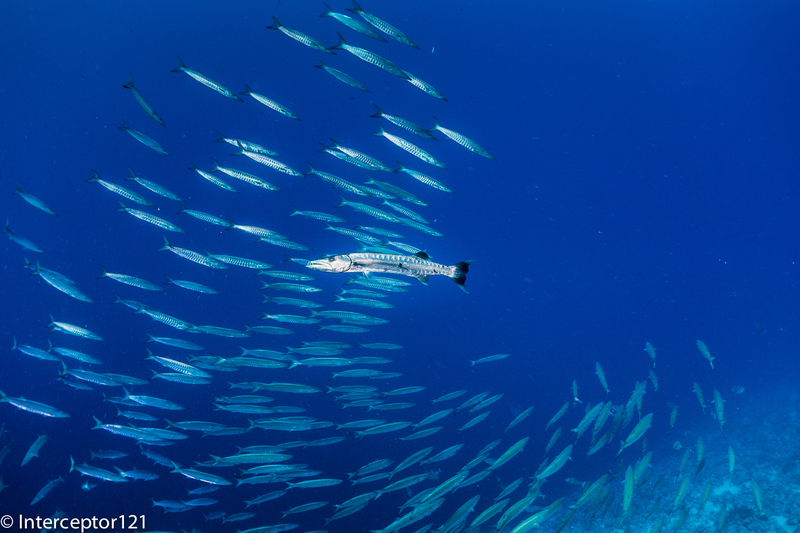 In the middle of the dives while I was waiting the barracuda school came out to play. Barracudas are quite tough as they require strobes to lit properly and I find the multitude of black and white shots that you see a bit boring as the fish texture is what makes the shot. You have several challenges with the formation, if the school is big is difficult to take it all unless you are on the bottom or on the top. In the first case you need to control bubbles in the second you shoot the bottom so better be neat. It is impossible to illuminate properly all of them but this shot has got the right geometry and I think is quite pleasant. On the second dive I was lucky to spend some time with a Giant Barracuda that was literally commanding the school at sight, very rewarding from a diving point of view I got so excited that I kept shooting with a relatively slow shutter speed however the fish that is lit by the strobe is well crisp. 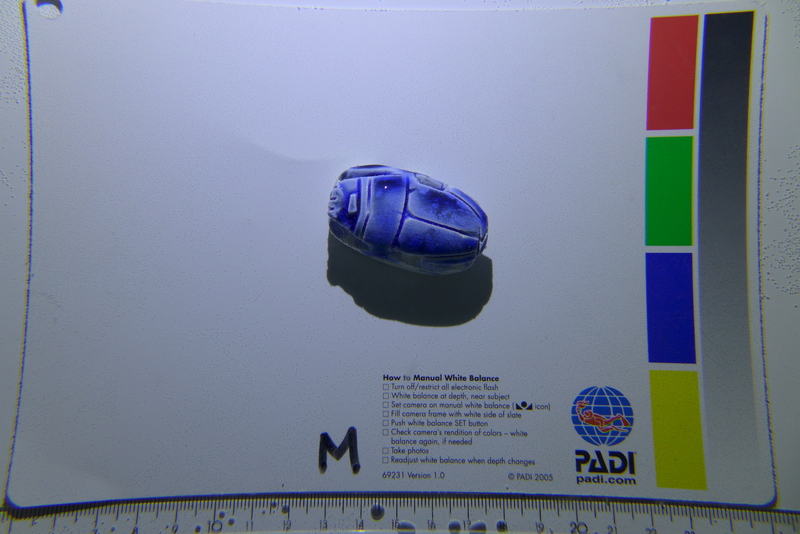 This shot is much deeper than the previous so the blue is colder but still makes for an interesting shot. It was time to rinse the gear (if you could call that hosing it quickly on the dive platform) and get ready to leave the day after. On the last day we were asked to put together a selection of our best 10 pictures and were give a video with some gopro footage taken by the ops manager plus our slideshow. Considering the time it was spent to do it the result is excellent.I hope this has given you an idea of the workshop that I definitely recommend, on the next post I will write my personal lessons learned from such experience. After the first 3 days of workshop we got into the core of it and Alex talked about schooling fish and how to take shots. 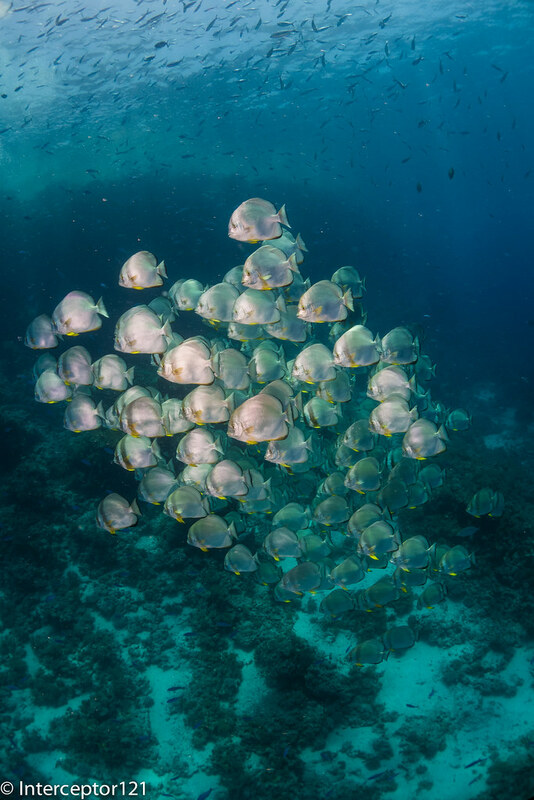 Detailed information was given in terms of how to best approach the fish depending on their behavior and also about the etiquette in terms of letting other people best positioned taking their shot first. The surgeon fish are not that photogenic and actually quite messy I tried to take some shots when the current was pumping and they were all aligned close to the bottom at Yolanda however to me this is not that exciting as a shot. Other people got better results but I frankly was not that bothered about Surgeons. Probably as the fish is pretty dark and does not reflect the strobe much. The featured image close to the title shows what I mean. During this trip the current was not going north to south as usual but there was near to no current at shark reef and current going outward at yolanda corner. 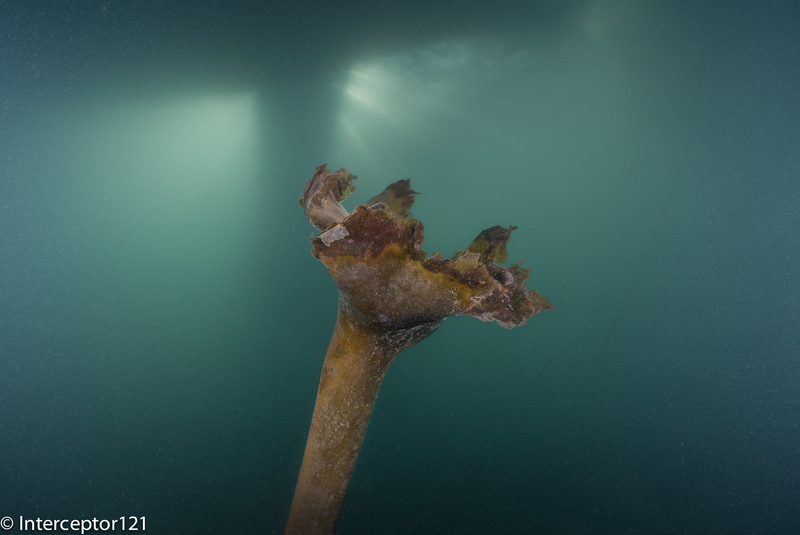 This means the snappers that usually sit at the edge of shark reef were not out to play. We were left with barracuda, batfish and jacks to choose from. 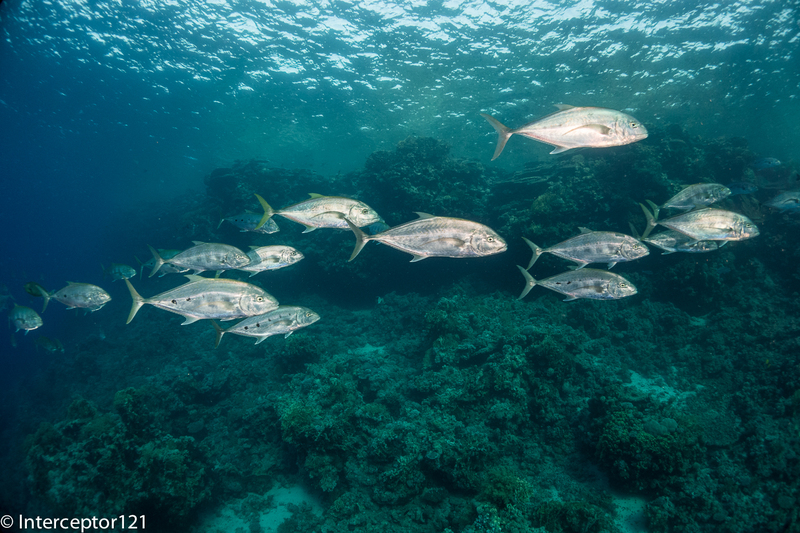 On day 4 I only see few giant trevally but not many schooling jacks so had to focus on barracuda and batfish. Unfortunately the barracuda were far from the reef and a bit too deep and did not really want to entertain chasing them so I tried with the batfish. Obviously there were not only us but also other boats so it was a bit of a competition for fish. So I focused on trying to get the best backgrounds for the pictures to come like in this case. Also had some fun taking images of the others and the batfish one or two came out pretty good. It is quite hard to have the discipline to respect rules when you are with other 18 photographer on the boat so the competitions had to be expected and I was not that bothered. In the evening we headed back to Ras Katy and I borrowed a Nikon D7100 from Nauticam UK. I asked to have a 9″ dome for the split shot and jumped in the water with the idea of just doing that. Personally I do not like split shots where the surface line is very distorted to avoid that you need to make sure your lens is near to rectilinear and it is better to shoot portrait as there is little distortion on that axis. 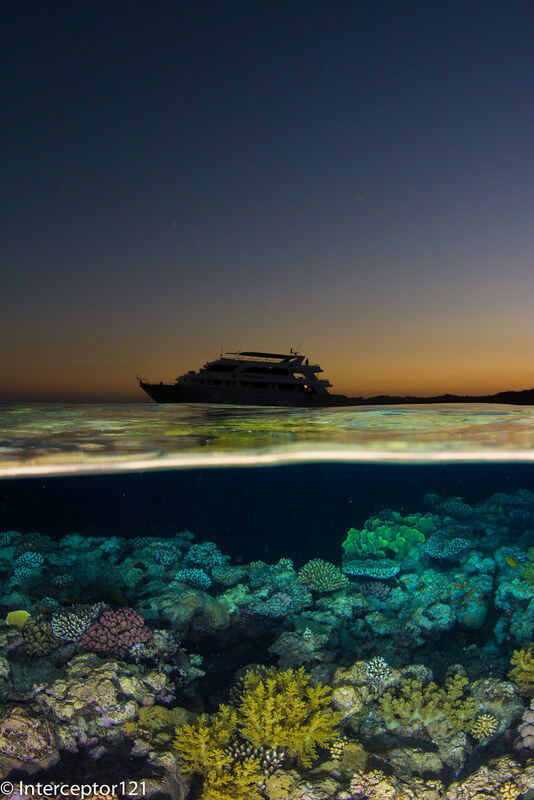 What I wanted to capture in this shot is layers, the reef, water under and over, the boat and sunset colors. I think it came out pretty good but it is painful to take 100 shots just to get one right and I wish I had some fish in the frame but never mind is good enough like this. The water was not really flat so that was an additional challenge as you can see the wave breaks on the lens creating a little thicker line but overall a good shot. Who has followed my initial LX7 tests is aware of the few issues I have had at wide angle with the LX7. One was the reflections back on the lens that I have now hopefully resolved using a black marker and changing the camera from white (and silver lens ring) to black and the other was flare. Flare is an issue at wide angle even on land. What causes flare? Stray light coming from the sides that washes out the picture and eliminates contrast in the process. Wide angle lens tend to have an ability to catch stray light from the sides and top and this is the reason why wet wide angle lenses have to be really coated well so that this effect is diminished, however it still can happen. And it did happen to me with the Inon UWL-H100. 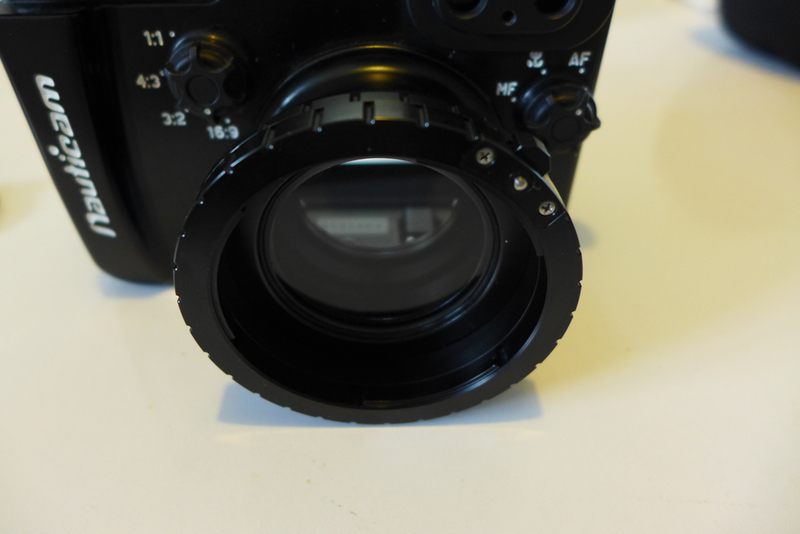 The general advice to eliminate or reduce flare is to have a lens hood however lens hoods are generally not an option for wet lenses with an M67 thread mount. The only lens that I know that can position the hood on a screw mount is the fix UWL28M52 or UWL04 most of the other lens do not have a hood and have a circular lens unprotected from stray light. And this usually means at some point you will get flare. So how do you get around it? In the case of the LX7 is pretty much a forced choice as the Inon UWL-H100 is the only lens that does not vignette at 28mm equivalent focal lenght so the possible solution is to put a hood on the lens. Inon sells a hood for the UWL-H100 but the hood is attached through 6 allen bolts and its position can’t be fine tuned so to use the hood it is a requirement to change mount from M67 to the LD bayonet. You need also to convert the lens itself into an LD bayonet. If you go to your Inon dealer there is a relatively cheap service part that allows you to convert your M67 lens into a bayonet. The LD bayonet is the latest incarnation of bayonet mount released by Inon. Whilst the old AD mount relied on a mechanical action to secure the lens, the new LD bayonet is much shallower and relies on a pin lock release to stay in place. 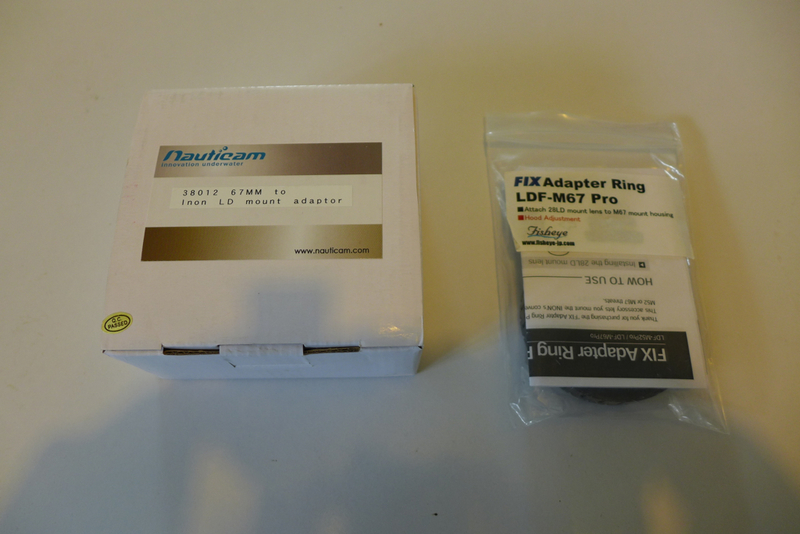 There are two adapters on the market that are capable of attaching LD bayonet lenses to an M67 thread, one produced by Nauticam themselves and the other by the Japanese Fisheye Fix. There is a price difference between the adapters with the Fix being 20% more expensive. 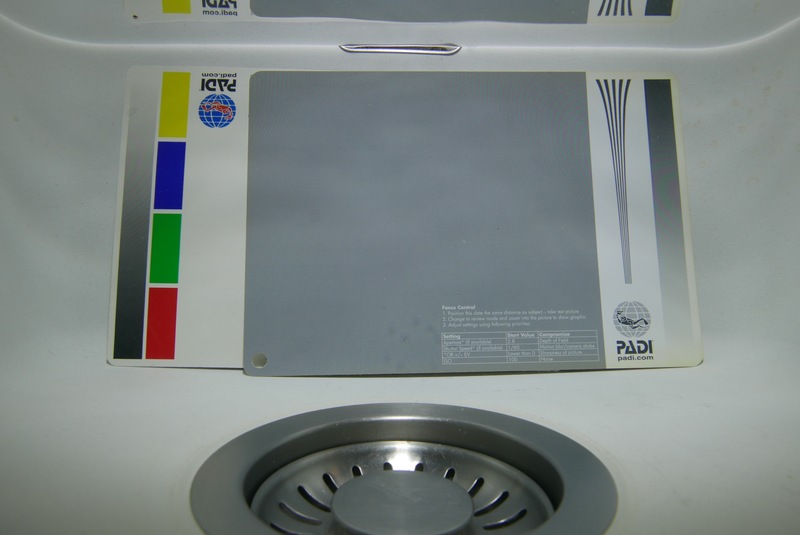 The Nauticam adapter is the largest of the two. It has 6 allen bolts on the front and a thumb screw lock on the back to fix it in position. With LD lenses there is only one position to put the lens hood in the correct place so if for some reason the thread ends in the wrong place with your housing you will need to unscrew the front of the adapter to ensure the release lock is on the upper left of the port this happens the same way on the fix adapter. 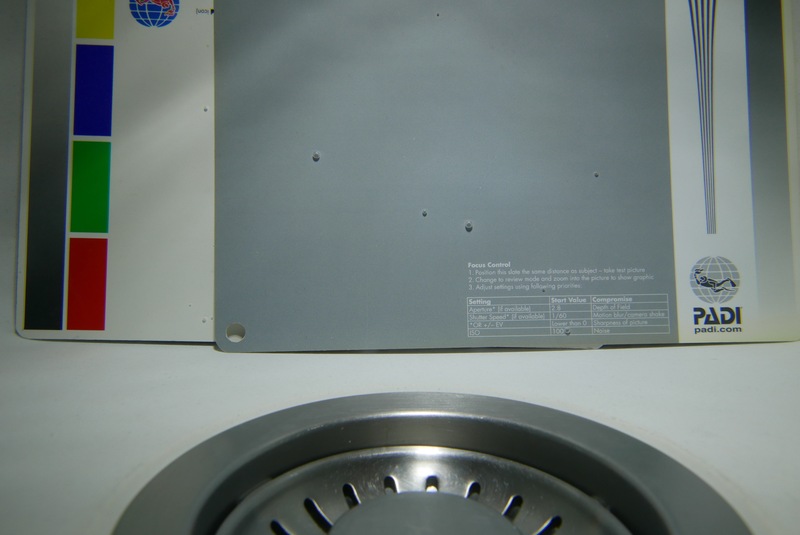 Make sure the little spring does not jump off in the process…Once the release lock is in the right area the fine tuning of the hood position is done with the thumb screw. A possible weakness is that if your housing port has no room for the thumb screw then this adapter is not good for you. 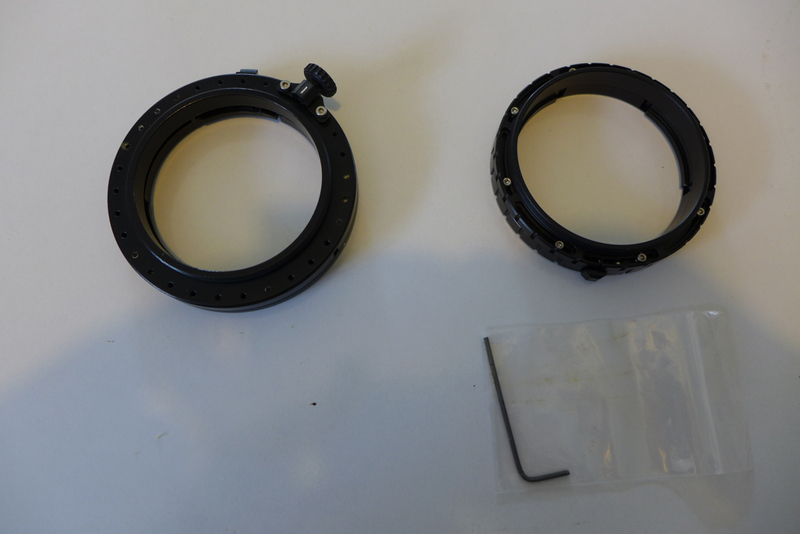 Whilst the Nauticam is made of plastic and metal the Fix seems to be 100% aluminum, this adapter looks better but does not have a mechanism to fix in place it relies on the strength of the M67 thread, however this locking system is compatible with any 67mm threaded port. The fix allows to perfectly fine tune the hood position and it shows. 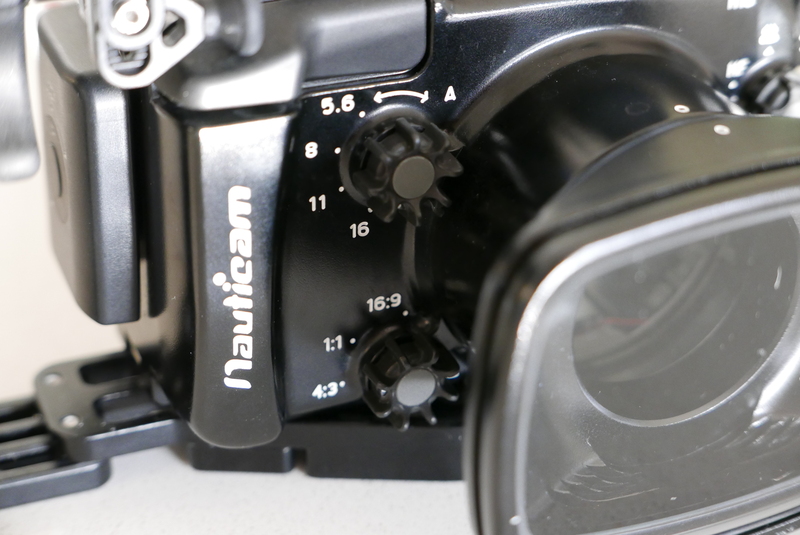 The alignment mechanism of the Nauticam adapter creates an alignment issue with the hood where the lens is few degrees turned clockwise. With the fix this does not happen. The hood can be properly aligned. 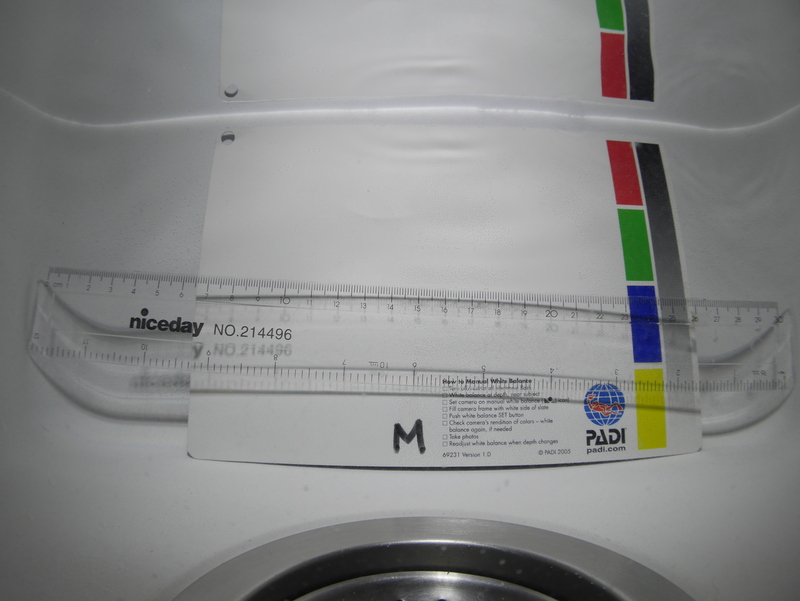 Note that in both cases this does not mean more vignetting as the corners are not covered by the hood. 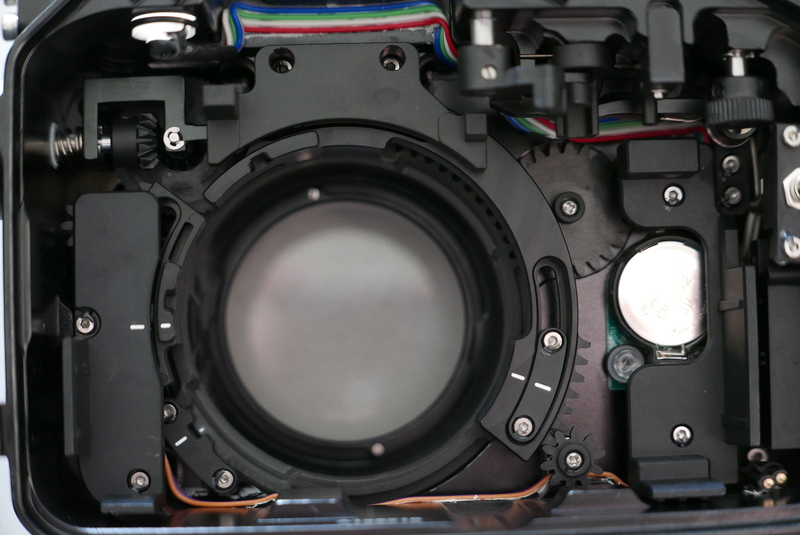 The other check I do is the position of the back of the lens, if there is a gap between the thread and the back of the lens this can create vignetting so it has to be as close as possible or even protruding as the Inon UWL-H100 mount type 2 does. Let’s have a look at the back of those two adapters with teh UWL-H100 28LD attached. 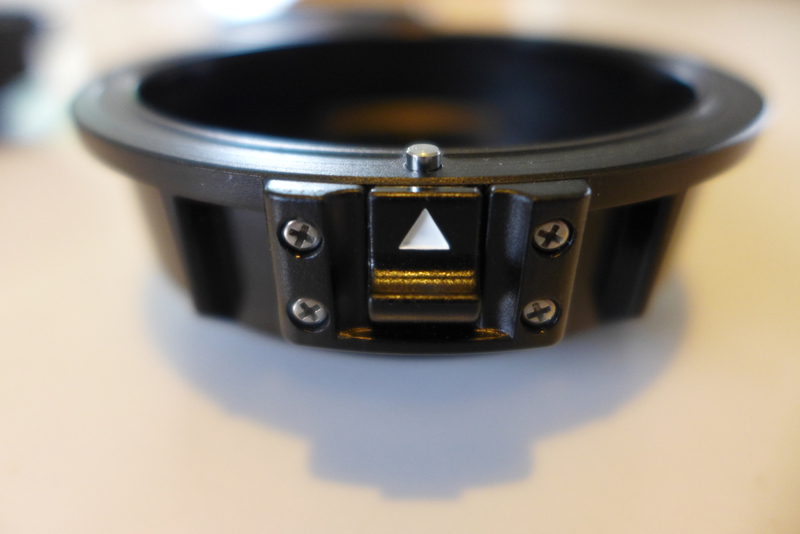 The Nauticam thread is somewhat too long so the lens sits slightly more inside the thread line. With the fix the situation changes sightly. 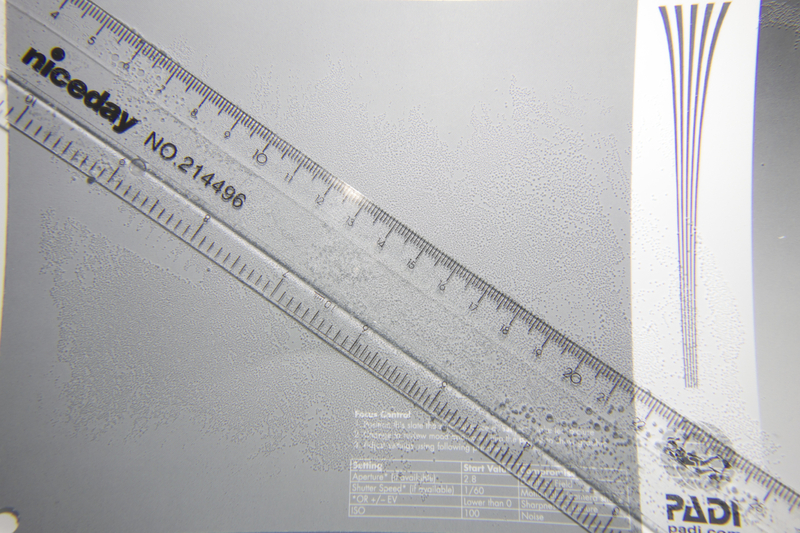 There seems to be little difference we will now check if there is an impact on the possible vignette in water. There is still a dark bottom right corner but it is less. Inserting a 1.25mm spacer between the inner housing and the left side of the camera improves matters, this is because the lens of the LX7 is somewhat misaligned in the Nauticam housing and this corrects it. With the spacer in the housing and the Nauticam adapter there is a tiny little residue of vignette but overall this is ok.
With the fix adapter this is the result. A final note: inserting a spacer in the housing is risky, you need to know what you are doing as in theory the chance of flooding could increase so this is not for everyone. My recommendation to those who want to improve contrast with the UWL-H100 is to convert to LD mount, attach the hood and get a Fisheye Fix LDF-M67 Pro adapter. Changing to bayonet has other advantages making lens swaps in water much faster and easier compared to the thread version especially with a lens as heavy as the UWL-H100. There are few design issues and manufacturing errors in the Nauticam LD adapter that create issues with the LX7, most likely other cameras that are not so fussy will have no problems but if you have an LX7 avoid the Nauticam adapter entirely until a new production version is defined. I have given Nauticam the feedback and they will probably react. When compact cameras were designed for 35mm it was quite common to shoot just with a camera and strobe; this allowed the average user to take decent close up pictures as long as the camera was capable of focusing within a couple of inches from the subject. Years later manufacturers started introducing wider lenses first came 28mm equivalent and most recently 24mm, these cameras give an increased field of view on land of 75 and 84 degrees diagonal. So why is it a bad idea to shoot just with the bare camera and no add-on lenses? At focal lengths shorter than 35mm pincushion distortion becomes stronger to the point the pictures are awful. So if you plan to use your wider compact camera underwater without lenses make sure you zoom to 35mm to avoid distortion. 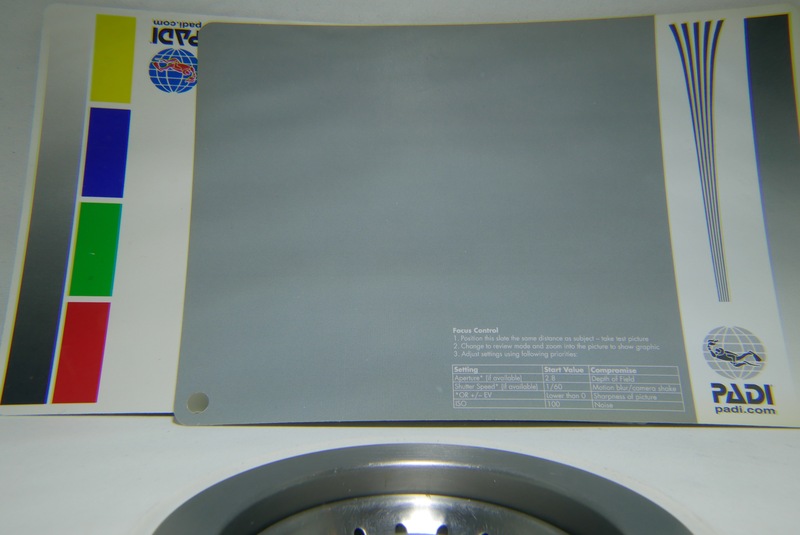 This is the same picture at 35mm note how the image is now rectilinear. At 35mm we are back were we were in the mid 2000 and all we can do is close-ups so there is no advantage having a wider lens for underwater use with a compact. Another common misconception is that a compact camera takes great macro just with the internal flash. Firstly a macro picture has a 24mm height of the capture area, nearly no compacts on the market are capable of this: the Panasonic LX7 and the Canon G15 within the current range are the exceptions. However at 1cm distance the internal flash is completely obscured by the lens, which means there really is no macro without a strobe and a close up lens: all you can shoot are close-ups. This explains the need for wet lenses in water, wide-angle lenses to increase the field of view and allow us to get closer and take advantage of artificial lighting, close up lenses that also allow us to get closer using the full zoom of the camera and shoot at increased magnification without being on top of our subject. The needs of photography and video differ as lighting tools differ, photos require strobe to freeze motion, video instead uses fixed lights. Photos are also taken at much wider angle than videos and fisheye effect is accepted, an effect that in video is generally not welcome. With this in mind what are the wet lens options for the Panasonic LX7? It depends of course on the planned usage of the camera. 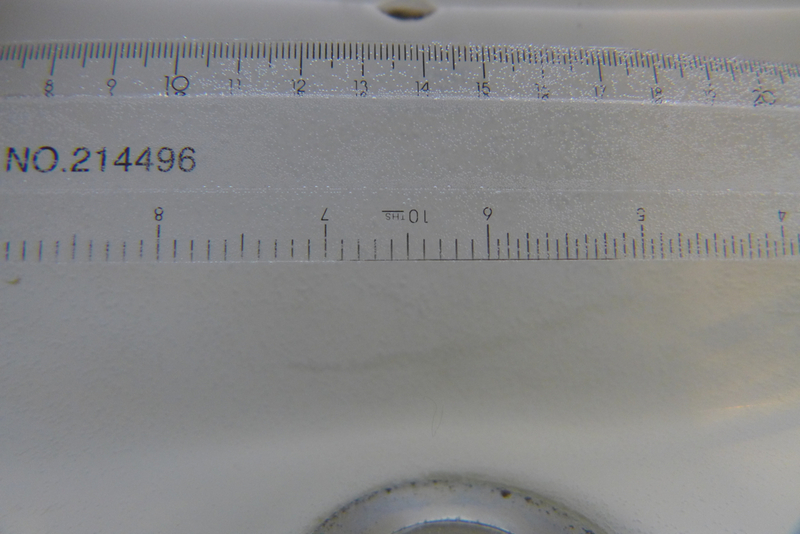 The LX7 has extremely good close up capabilities out of the box, however the capture area is around 12×8 cm that is not exactly small. If we want our nudibranch of shrimp to fill more of the frame we need a close up lens. 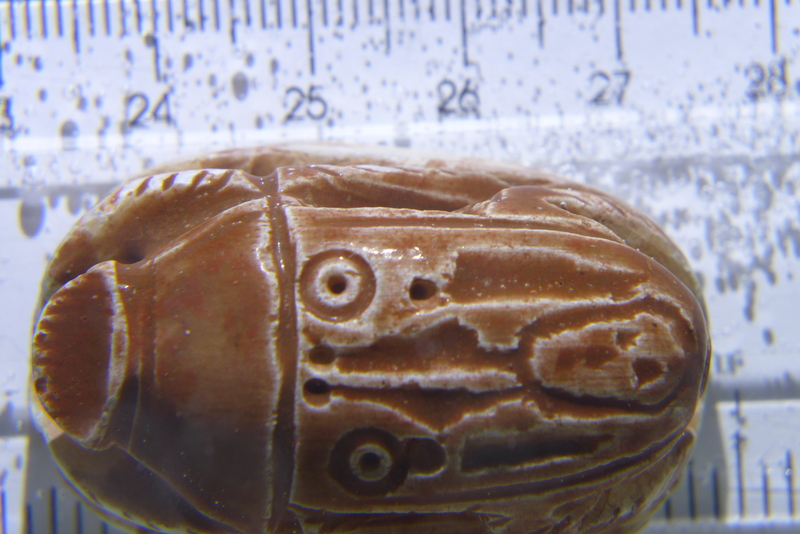 From my tests the Inon UCL165 brings around 2.5x magnification with the LX7. I have tried stacking two UCL165 but the amount of chromatic aberration is too much for my liking, I found that 9 diopters is the max before fringing becomes a real problem and I do not recommend stacking two of those lenses or two equivalent Dyron diopters. I think the most flexible set up is a UCL165 and UCL330, this covers all possible working distances. I do not have a UCL330 yet so I can confirm but I have taken shots with a very similar lens (Olympus PTMC-01) and the results are excellent with a capture area of 48×32 mm that is very close to real macro. The zoom of the LX7 is the real limit here as it maxes out at 90mm versus the 120 of a Canon S110 or 140 of the Canon G15. For close focus and ambient light wide-angle the bad news is that there is no fisheye lens that works well with the LX7 this is due to the extremely large lens. 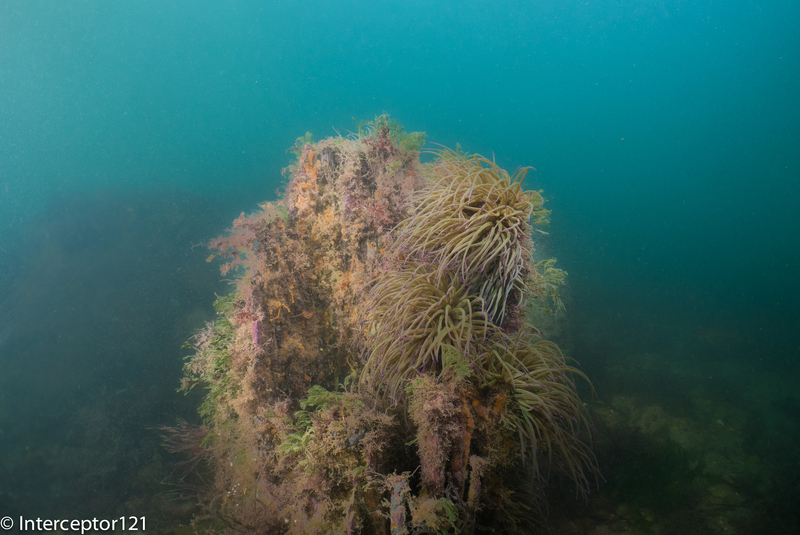 I have tested the Inon UWL-H100 and I had to wait for a new port to be delivered from Nauticam as their original one was too long and had vignetting even at 28mm. This lens yields more than 100 degrees diagonal and is my preferred choice for the LX7 for stills. There is however a good amount of blue and yellow fringing if I really have to be picky so the extended field of view comes at some price. I use Inon lenses however a possible candidate is the Epoque DCL30, this lens is reported to work with 28mm equivalent cameras however the rear lens is smaller than the Inon so I believe this needs confirmation. 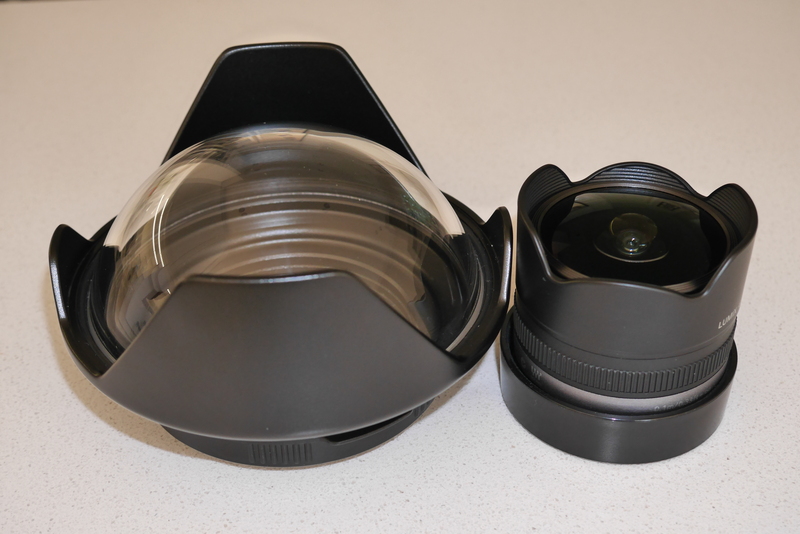 There is a $70 difference in US and £70 here in UK between the two lenses and considering that a dome will not worth I encourage testing this lens as the results may be acceptable. I think bluewater photo markets this lens in US under their own brand. If you plan to use the LX7 for video the situation is different, as the camera close up performance is extremely good and usually macro video is very hard. Most time we shoot with ambient light and if visibility is acceptable getting that close is not so important considering the LX7 ability to manipulate white balance. The first suggestion is to get a Nauticam Wet Mate, this is a sealed air dome that gives us back the air field of view and works extremely well without any chromatic aberration and extremely sharp corners. 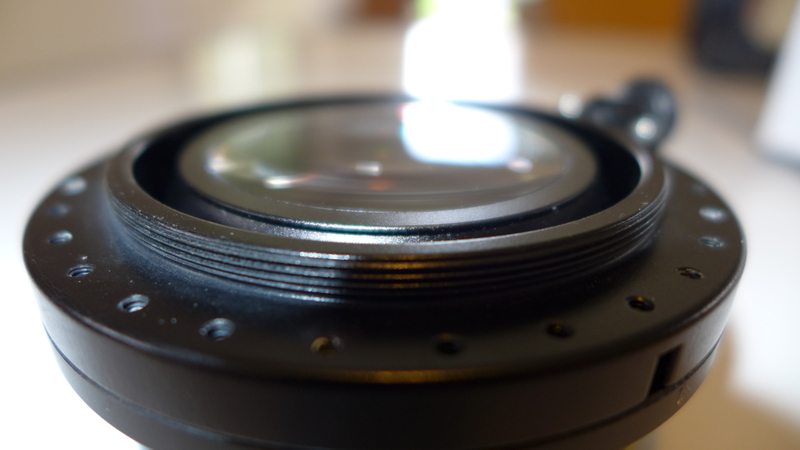 This lens keeps the image rectilinear that is also a good thing for video. 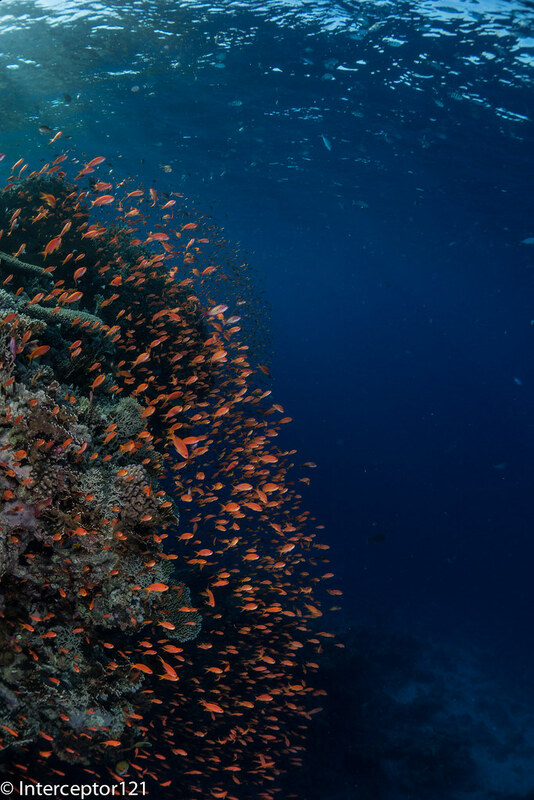 For majority of reef dives the wet mate is all is needed as this also allows the full use of the zoom without soft corners that occur if you zoom into a wet wide-angle lens. This lens is the most versatile for general video use and costs $250, great value from Nauticam. There are however specific situations where the wet mate is not sufficient, as before close up performance with the bare port is good but not great for smaller critter, so a close up lens would be the next addition, again an Inon UCL165 or a Dyron Double Diopter would work just fine and have the same power. When shooting at closer distance with lights, or when there is large fish or wrecks a wet lens is important as the 84 degrees diagonal of the LX7 are actually only 76 horizontal. Again the Inon UWL-H100 is my choice but would check again for the Epoque DCL-30. One characteristic of the LX7 that is interesting is that the diagonal field of view of the camera remains constant when picture format changes, this means the horizontal field of view is larger at 16:9 movie mode than it is at 3:2 for pictures. In general terms with the wet mate we can cover 1.56x the horizontal field of view of the flat port and with the wide-angle 2.1x. 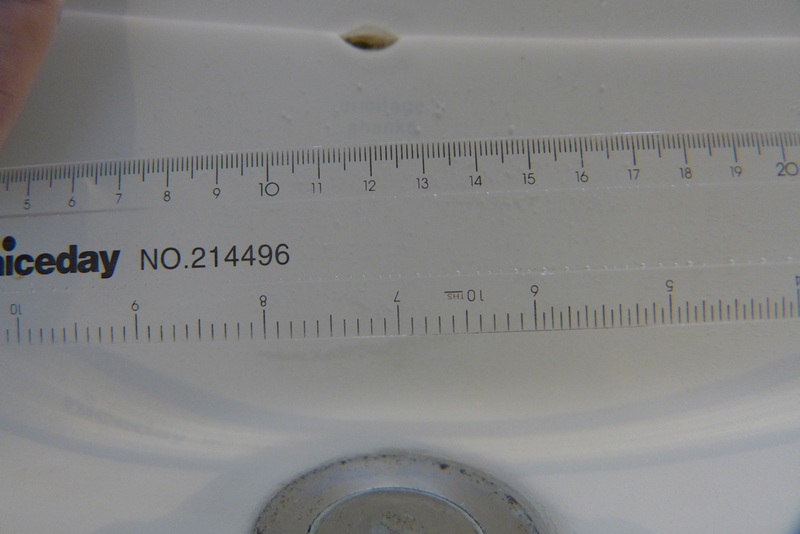 The wide-angle offers an additional 35% over the wet mate don’t be mislead by the apparent small difference between 84° and 100° as those are diagonal measures not horizontal and those few degrees more count. 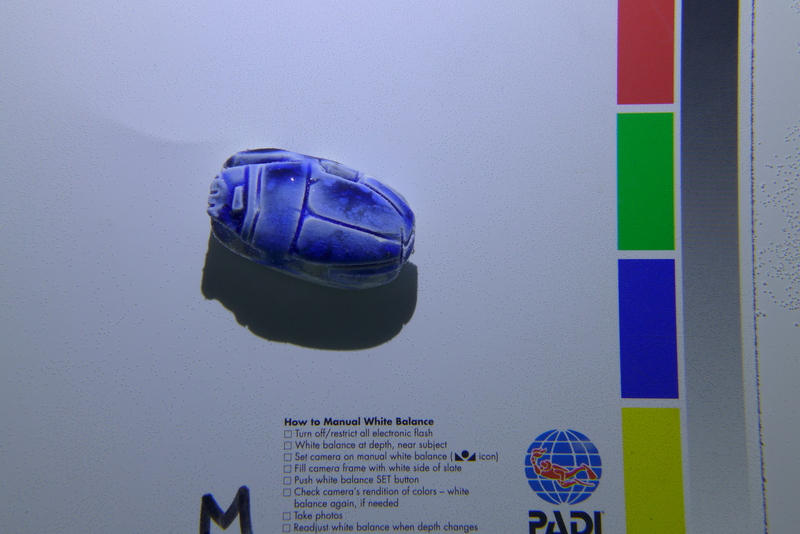 At 1 meter distance the maximum subject size with the wet mate in movie mode is 1.56 meters and with the wide-angle this becomes 2.1, that confirms that the wet-mate is good for general use and the wide-angle is only required for close scenes of larger fish or wrecks. Those are the three lenses I have used for those tests. A final consideration is about the lens mount. I will use the LX7 for video so my choice has been a 67mm mount, because this is the only format that the wet-mate offers. If I was using the LX7 only for pictures I would prefer the flexibility of the Inon LD mount even if this costs a bit more as it makes it so much easier to swap lenses in water when you have a bayonet mount. Some people will recognize the Canon PowerShot A570IS, the Canon S95 and the Panasonic LX7. The first shot VGA video, the second 720p HD and the last AVCHD 50/60p. If you look carefully you can also see how the front aperture of the lens gets progressively bigger and bigger. Year after year compact cameras are becoming more powerful having electronics that allow higher resolution and image quality, I think the GoPro is a demonstration of what you can do pushing the limits of simple optics using ultra integrated electronics. Compact cameras like the A570IS used to have lenses that would be equivalent to a full film camera with a 35mm lens, this has been a popular choice for long time. Some years go Olympus and afterwards Canon, Sony and others started offering plastic housing for those cameras to take them underwater this was the start of consumer underwater photography. 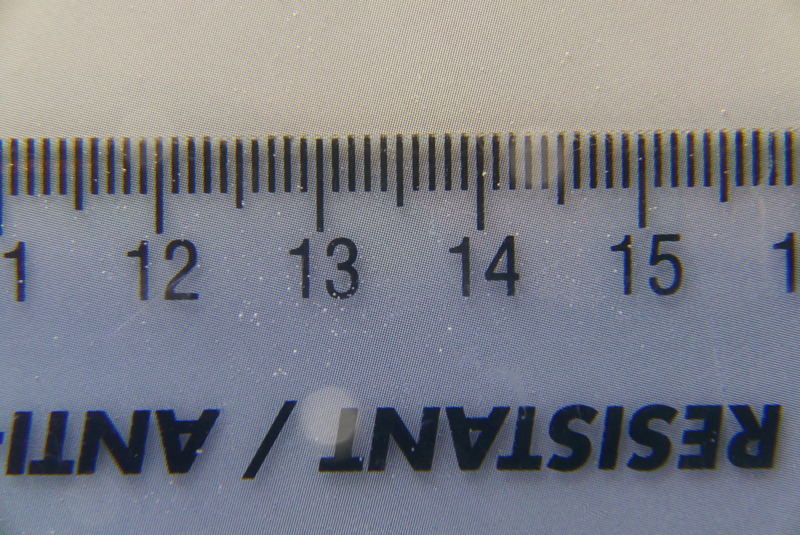 There are however a number of challenges using a 35mm camera for underwater photos and the most obvious is the field of view, because of the magnifying effect of water those compact had really narrow coverage that limit them to close up of macro shots. However a little time after wet wide angle lenses come into the market and offered range of coverage up to 100º some manufacturers also produced seme-fisheye lenses with coverage of 165º the most well known being the Inon UFL165AD. 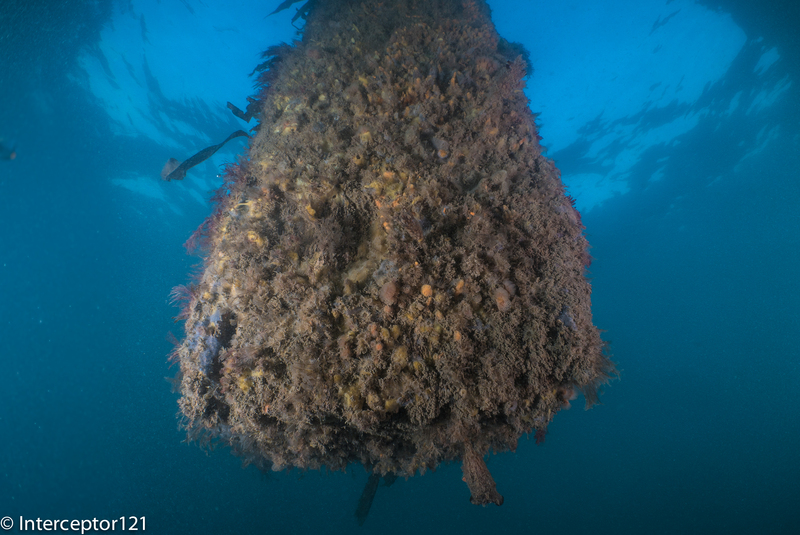 All went well and compact camera photographer could take wet lenses with them and in one dive take pictures of a nudibranch as well as of a wreck thanks to removable lens in water. Then the consumer market pushed manufacturers to increase field of view so it was the start of 28mm equivalent cameras like the Canon S90, this format is still very popular with the Canon G series and the new Sony RX100, in addition to that there was more and more demand for extended zoom so that the camera could be useful in all situations, today is not uncommon to have compact cameras with 20x zoom. The introduction of 28mm equivalent cameras meant that the cameras would vignette with a lens designed for 35mm so wet lenses had to be readjusted and re-designed. The extensive zoom by this you mean over 4x meant that the wet lens would be so far from the camera lens that effectively no wet lens would be useful, this has been the curse of the Canon G series a great camera that never had any good wet wide angle solution until very recently with introduction of zoom wide lenses from Inon. We can see the effect of pincushion distortion in the deformation of the shape of the slate, it is quite apparent when you look at the lines and how skewed they are you can also see a purple tinge to it. A wet wide angle lens not only expands field of view but also corrects pincushion distortion and chromatic aberration, this is the key reason why some form of wide angle is always required. In the last two years manufacturers have come up with 24mm equivalent cameras, such as the Canon S100, Olympus XZ-1 and Panasonic LX5, unfortunately those camera have even more pincushion distortion, and for this reason should never be used in water at wide end to take pictures without post correction that can be quite hard to achieve so as a matter of fact many people live with ugly deformed pictures. Those cameras make it even more difficult for wet lenses to work and to date there are very few lenses that work without vignetting, those lenses require a wide aperture on the side of the camera also to allow larger and larger image sensors that camera makers use like the LX7 in the feature image. To give a demonstration of why is a bad idea to take your 24mm camera in water without any wide angle lens we just have to look at the picture above. Shocking! So with 24mm cameras we are stuck, the wet lenses with dome that work well with the 28mm cameras end up vignetting so badly that all the advantage is lost when you zoom in. In effect with a 24mm camera all we can aim is 100-110° field of view that for stills is not really that much, there are exceptions like the Canon S100 but in general terms options are limited. Camcorders on the other hand always had a range between 30mm and 150mm if not more with extensive zoom, you would have needed a dome port atteched to the housing that would allow zoom to give the same functionality in water or diopters to zoom at close range. 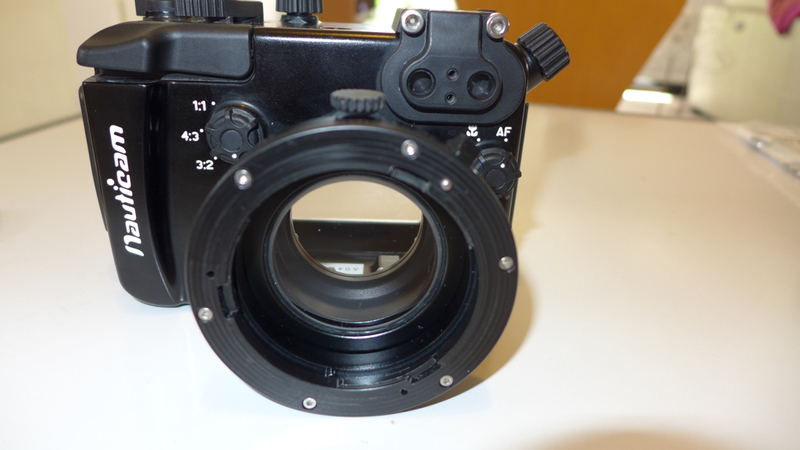 A user of a Sony camcorder in a gates housing would be looking at 30mm like a very wide lens!!! Typically you need fathom lenses to reach 90° and lenses with 110° coverage cost $4,000+ so definitely not affordable to the average shooter. Where does this leave us? Well surprise good news for all 24mm compact users that want to shoot high quality video there are plenty of options that don’t break the bank!!! When zoom cameras like the Canon G7 come into the market some manufacturers like Fantasea, H2O tools, Ikelite started producing wet domes. Those domes are made of two lenses with an air space and if set really close to the housing port have the effect of restoring the original field of view of the camera. Now for a 28mm equivalent like the Canon G series this is not that exciting as we are talking about 75º diagonal but for the 24mm camera users we are talking of 84° diagonal coverage, a value that a professional camcorder user would be very happy with. In addition you can also use the zoom which means that if the camera has really close focusing distance a wet dome is all you may need for 85% of shooting circumstances. 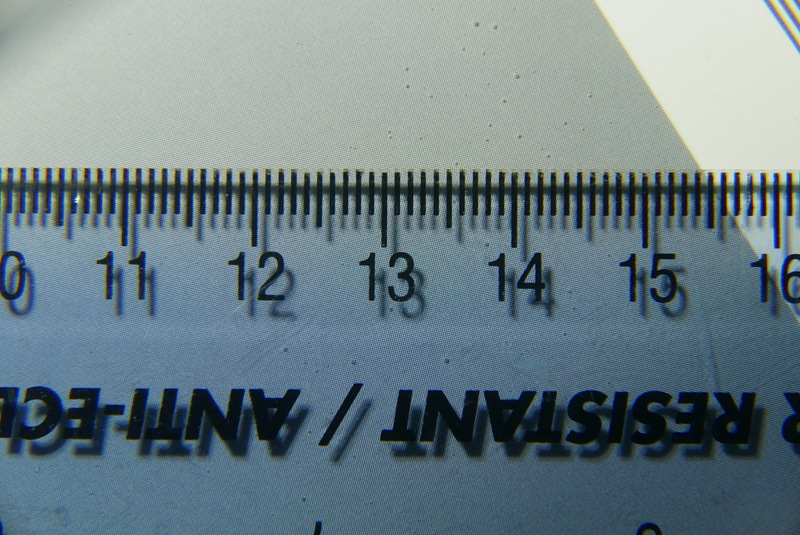 As you can see the image is not only wider but also rectilinear no barrel distortion as if we were shooting on land. Personally I do not like barrel distortion for video, and this is the reason I don’t like videos shot with fisheye lenses so this suits me fine. Of course 84° are not really wide for large wrecks, whale sharks or similar for those situations you still need a wet-wide angle lens but the Nauticam Wet-Mate costs $250 plus taxes so you really can’t complain. At telephoto the flat port does not have pincushion distortion but it could be painful to remove the wet mate in the water the good news is that with the wet-mate you can still make use of the full zoom so if your camera has a really short focusing distance this may be good enough for most situations. To finish off this is the Nauticam Wet-Mate, there are as I said similar products made by other brands. It is build of Aluminum with two lenses with a sealed airspace, construction seems very similar to some fix products. 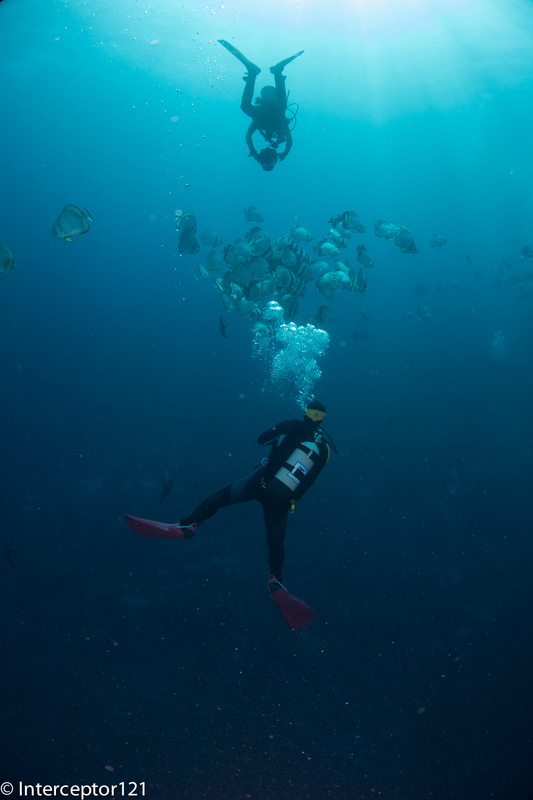 So if you have a 24mm compact camera that takes HD video and you are frustrated with still there is a whole world in front of you with those dome adapters you could be well set for underwater video at very little investment. And the good news is that you do not need an aluminum housing just something that takes a wet dome, Ikelite for example has 67MM thread on most housings for those cameras.